Oh how I love living in Africa. This was one of those moments which will remain with me forever. Siyabonga brought me a ‘pigeon’ in a box the other morning. He told me that he had seen it being chased by an eagle (I wasn’t there, so have no idea which variety) and flew into the kitchen window. I peered into the box and immediately recognised this frantic creature jumping up and down trying to get out as the elusive Narina trogan. So thrilling as I have only ever seen it once before. I carefully picked it up and felt that unmistakable terrified heartbeat. I wanted to just check that there was nothing broken. 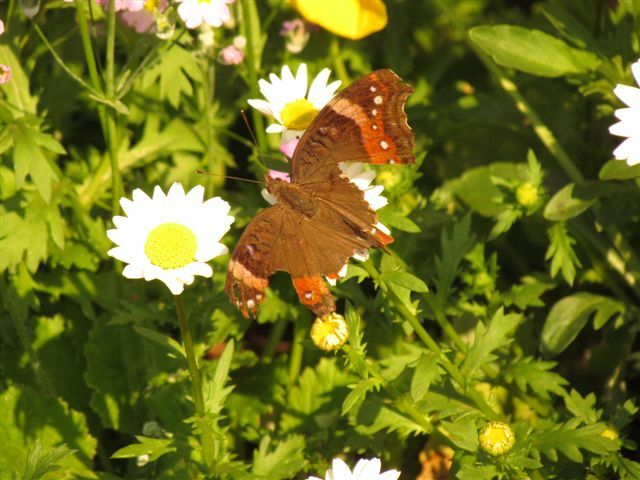 In a matter of seconds, he had calmed down and I was able to examine his wings and legs. He started to sort of purr/coo at me and despite my hand being completely open, he sat there for nearly 5 minutes! Maybe it was just vanity ‘cos one of my staff had time to go and get his phone and take the pictures. When the photo shoot was over, he flew back into the forest where he belongs, seemingly completely unharmed. What a magic moment. 27 Sept Would you Adam and Eve it! 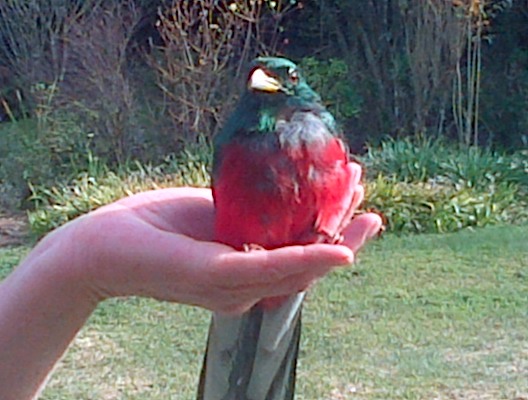 I rescued the second Narina trogan which failed a suicide flight into my daughter’s bedroom window this morning! 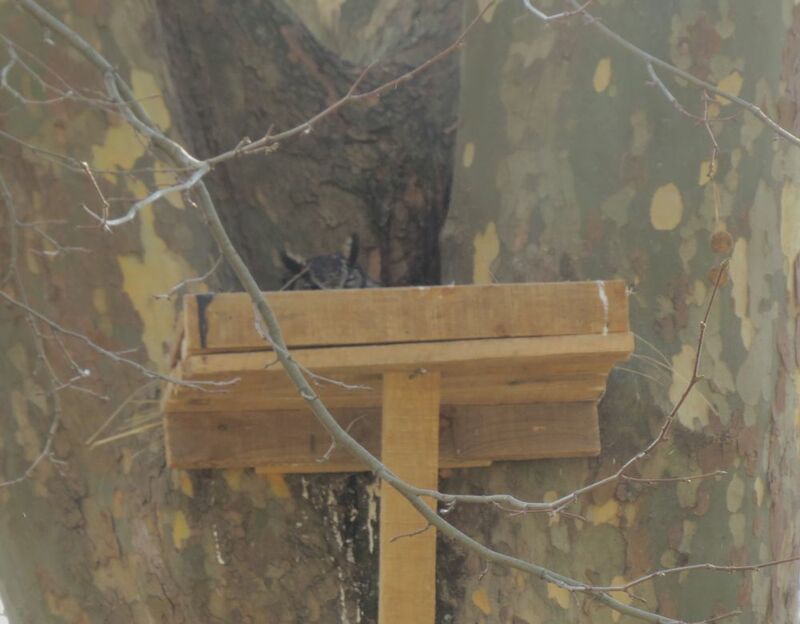 What are the chances of 2 such elusive birds needing help in as many weeks? This one seemed much younger as the colours were not quite all there and it was smaller. It stayed with me for quite a long time and then I put it on a branch in a deep bit of the garden where it remained for a further 20 minutes until flying off into the forest. Wow! I seem to be having a very exciting couple of days. Yesterday I heard the Samangos going absolutely crazy at the end of my garden, they were screaming like banshees! As I turned around to see what was going on a huge Martial eagle flew out of the forest, swerved around towards me and sliently flew past about 20 metres away. it is only when they are that close that you fully appreciate the sheer size of these birds! 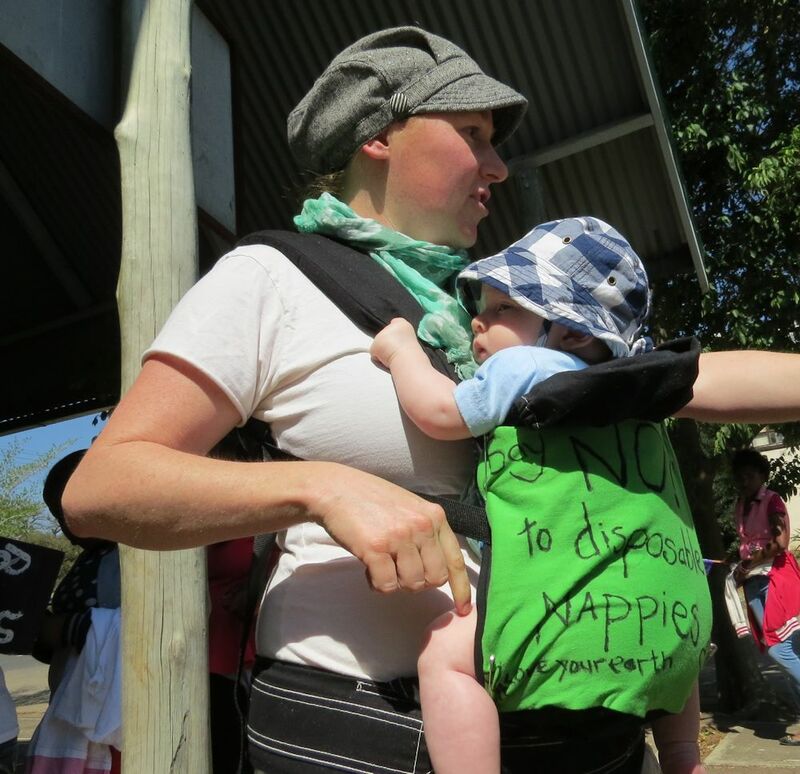 Thank goodness there was not a baby Samango hanging from its talons. Wow! Being a hot September, reptiles came out quite early, and one afternoon, while repairing electrical outlets that serve our pressure-booster water pump and the new “coldroom” container, I came face-to-face with a boomslang of about 750mm, which had come to the water pump to drink – there’s a minor water leak there that no amount of clamping has been able to stop completely. We stared at each other for a few seconds, before it made its way over the cut-back granadilla stems, to the bushy areas on the other side of the dividing wall. On the subject of reptiles, Kat & I spent a short time at the old house ruin overlooking the Hopedale Mistbelt Sanctuary dam, and were thrilled to see that the Natal Spotted Green Bush snakes that are resident in the ruin, are thriving and growing. I first saw two shed skins, each of about 500mm in length, and then 2 of the 3 known residents showed themselves, one with just a few coils, the other with its whole length along the top of the northern wall of the ruin. 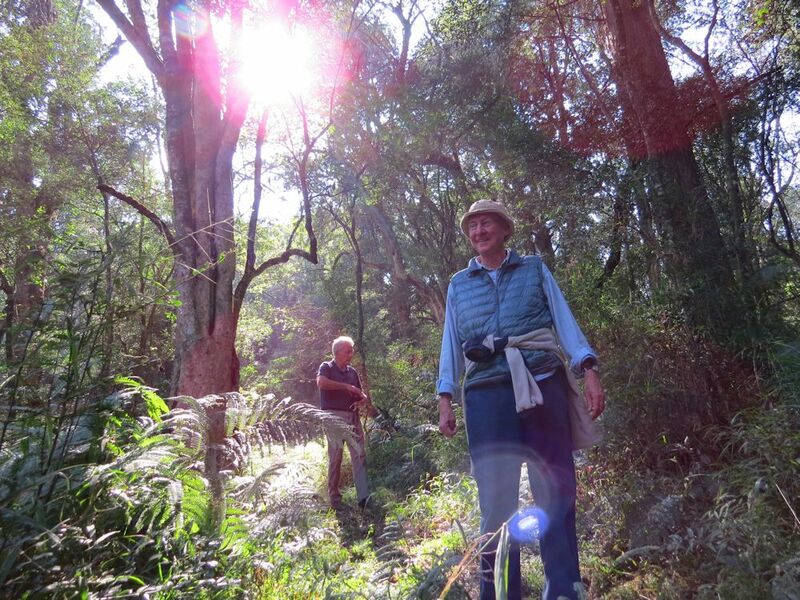 Kat visited the Aloe Ridge indigenous forest on Sunday 14th, and saw ten Bushbuck in the forest, and a whole lot of Reedbuck on the grasslands around the fringes of the forest. She also heard the wild pigs fairly close by, but didn’t see them in that dense part of the forest. 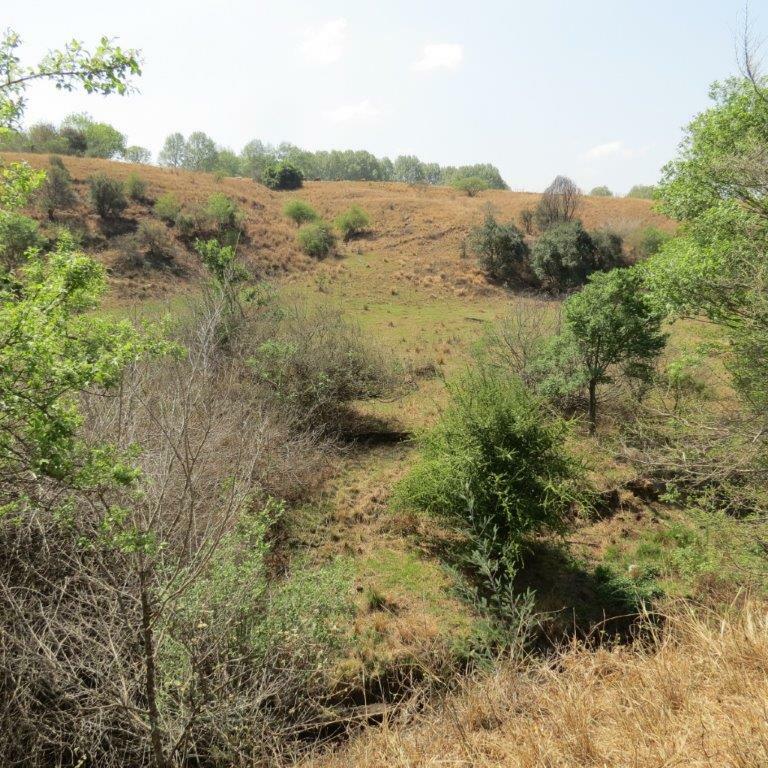 It seems we’re managing the remaining KZN Midlands Mistbelt Grasslands to the satisfaction of the buck species resident on Greater Hopedale, as the Blesbuck and Reedbuck are congregating on the short-mowed grasslands and the wider firebreak we burned this year – down the watercourse feeding the main dam (the first burn of the area since 2008’s runaway fire that started higher up in the Dargle and raced across Upper Hopedale in about 10 minutes, under Berg wind conditions). On Saturday, we saw the Blesbuck grazing on the new growth on the firebreak, near a group of 3 Reedbuck, with a further 3 “reedies” not far away. The Blesbuck have been decimated by poaching over the last few years (mainly on Hopedale Portions 1 & 2), and less than half of the herd of 15 that were resident when I joined Kat on Aloe Ridge 4 years ago, remain. 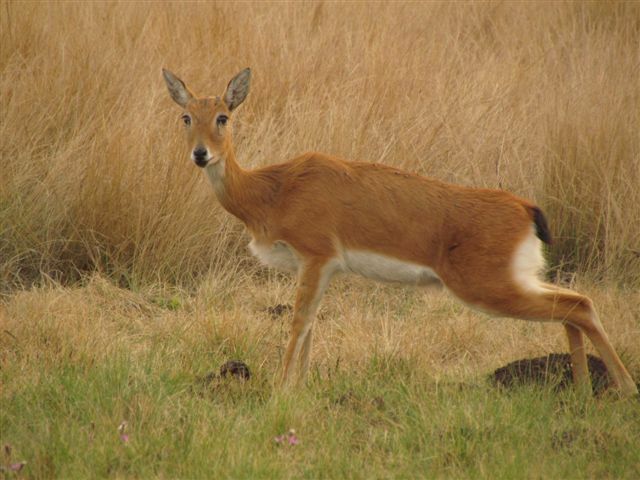 Similarly, the Reedbuck population has been affected by poaching on Hopedale 2 and around the fringes of Hopedale. 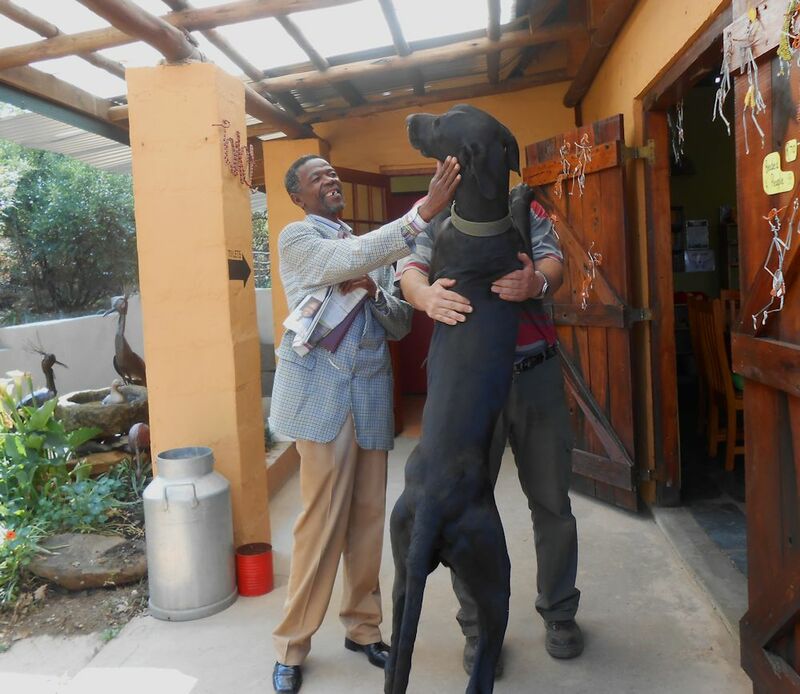 Since buying Hopedale Mistbelt Sanctuary from Andrew Nash 3 years ago, we have established a presence on that part of Hopedale, confronted dog hunters on Aloe Ridge hill, and removed numerous snares along the Umngeni floodplain, all of which have almost eliminated poaching on our own 2 portions of Hopedale. Due to jackals hunting in packs having taken half of our 2013/2014 season’s Nguni calves, we now bring cows that are due to calve up into the sheep-fenced pastures just below the house on Aloe Ridge. About 10 days ago, we were woken at 2am by a cow, and, on checking, we saw that it was getting ready to calve. Feeling confident that our calving management plan was good, we went back to bed, & were woken again just before 4am with a jackal sounding off. I sprang out of bed, grabbed the spotlight torch, and saw that the beast was disappearing down the roadway. It had been in the roadway between the house and the field that the cows were in, and the cow we’d seen earlier had just calved. Since then, we’ve had 2 more calves born in that same field, but the jackal hasn’t returned, and it must have told the rest of the bunch that it had a close shave, as no others have showed up at calving time either. Our Belgian Shepherd, Kelly has taken over the role of watchdog, and, about a week ago, at about 2 in the morning, she gave 4 sharp barks. When I went out to investigate, she sat bravely on the veranda while I scanned the area with my torch. Hearing a rustling, I shifted the torch beam in that direction …. right onto one of the biggest porcupines I’ve ever seen!! It was quite relaxed, with its “mohawk” quill-line intact. It wandered around for a few minutes before getting out of torch-beam range below our sand arena. Kelly’s braveness in staying on the veranda while I followed the porcupine across the lawn is a result of her having run full-tilt into one in the dark driveway a few years ago. On Friday afternoon, Kat persuaded me that, since we’d worked through Heritage Day with our staff (who then had Friday off), we should take a belated Public Holiday and go to Hopedale Mistbelt Sanctuary dam for some fishing. Sitting on the boat (Kat-a-Splash), we noticed some juvenile Grebes swimming & diving not far away. Eventually, one came quite close to the boat, & I tried to get a photo with my mobile phone camera – at times like this I regret not having a good camera any more!!! Also, a solitary waterfowl that looked almost like a Pygmy Goose, flew in and did a perfect touchdown on the dam, before paddling over to the exposed rocks to sit and preen, and call. We used our “far-eyes” (binoculars) to get a closer look, and then, that evening, pulled out the ‘birder books for amateurs’ to look up what we’d seen. It turns out it was a South African Shelduck. Beside the dam seems the most sensible place to be in the hot, dry weather. Along the edges here is evidence of plenty of visitors at cooler times of the day. 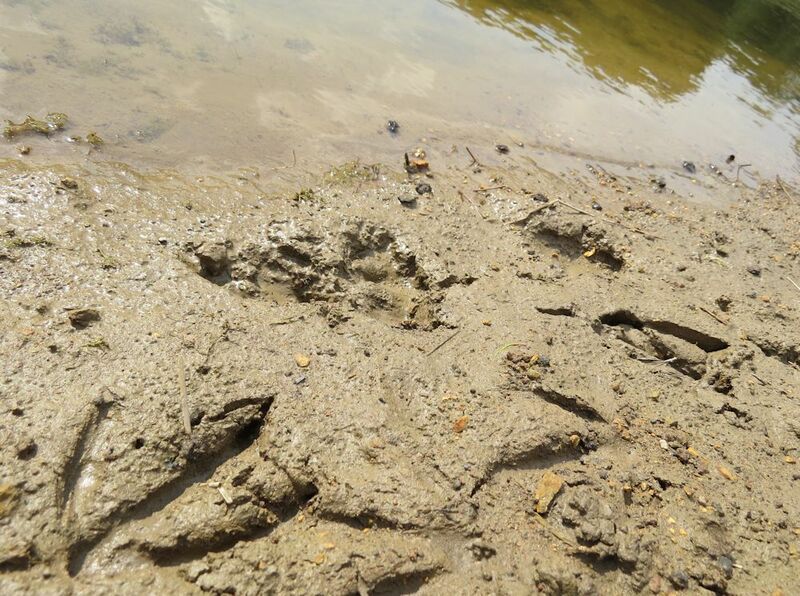 Obviously, there are lots of hungry creatures about, so getting your legs stuck in the mud is a risky business. 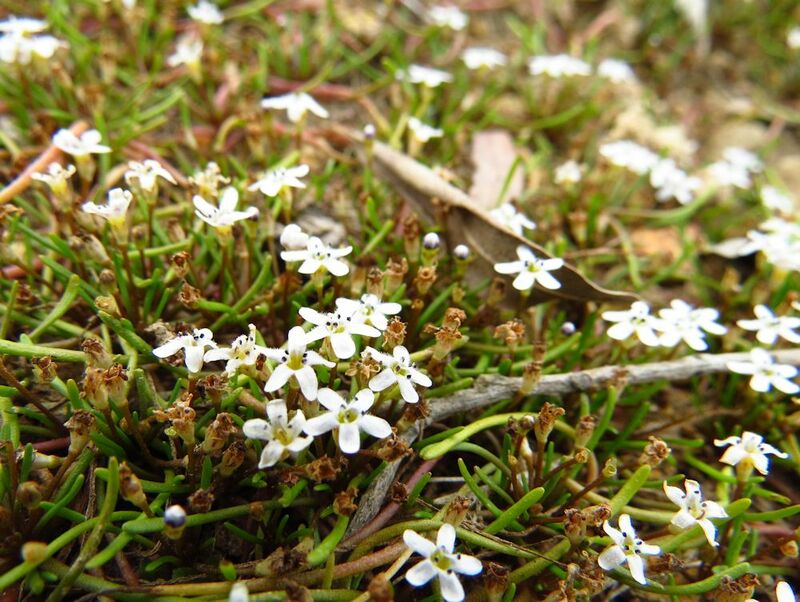 On the exposed damp banks there are masses of tiny white flowers – Limosella longiflora. 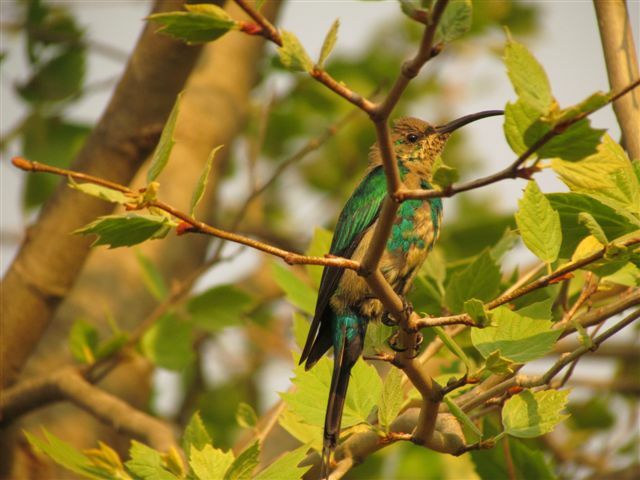 I have heard the so called “rainbird” – Burchell’s Coucal – calling lately along with Blue Cranes, Bar-throated Apalis and Crowned Eagles. 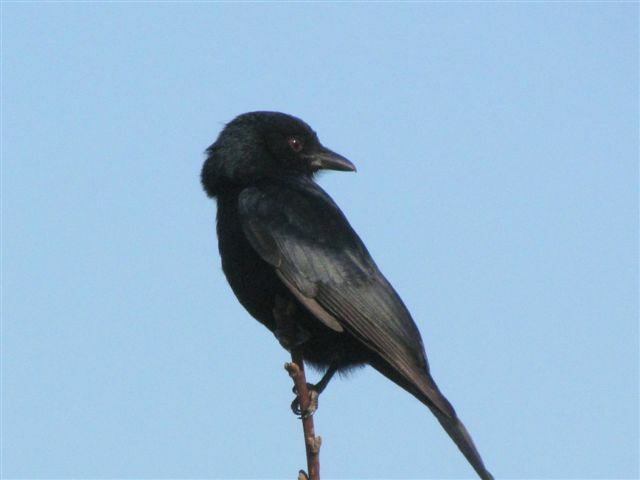 Heard the first Klaas’s Cuckoo on 27 September, Piet-my-Vrou won’t be far behind! Lots of birds are seeking succour in the relative cool and damp of the garden. Drakensberg Prinia, Cape Batis and Chorister Robins are my favourites. Tree dassies are making a huge racket at night. 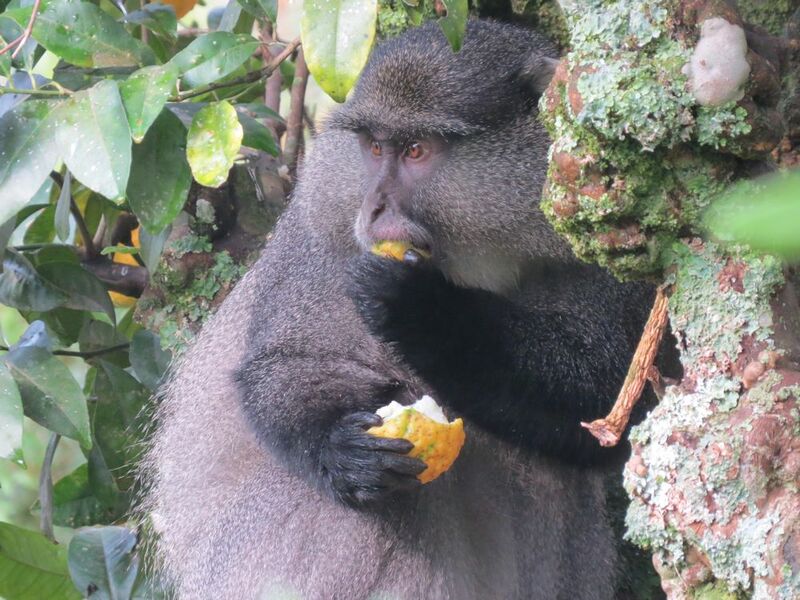 Samango monkeys are making the most of the fresh green leaves on the Celtis trees. This fellow enjoys the abundant fruit on my lemon tree. 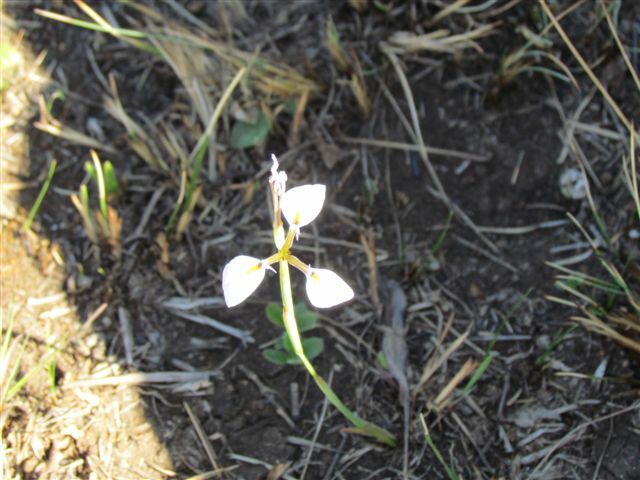 There are flowers in the grassland – especially in protected rocky areas. 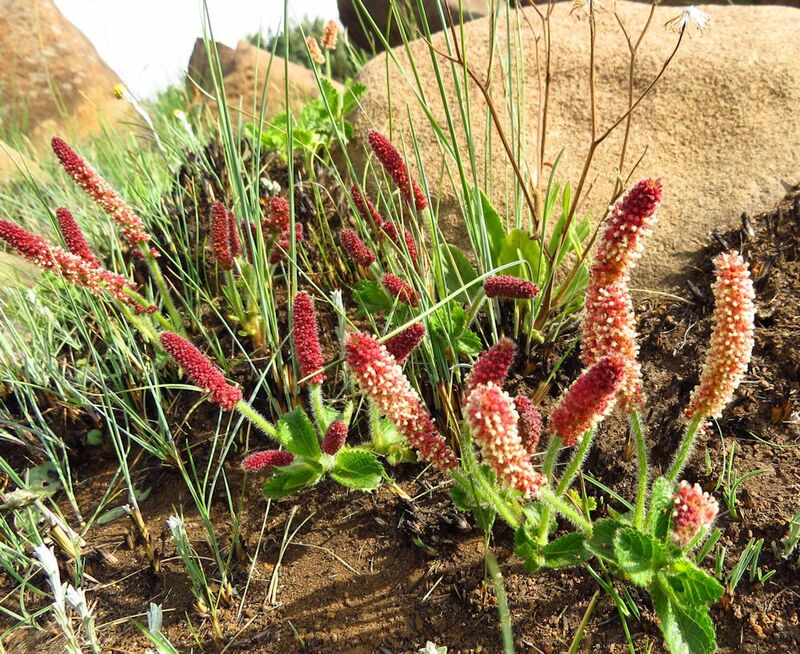 I have spotted Rabdiosella, Teucrium, Bekheya, Helichrysum, Nemesia as well as the delightful Acalypha penduncularis which has male and female flowers on different plants. These are male. A new visitor to our garden this month is a Southern black flycatcher. A pair of pied crows are making a nest in a pine tree. They have been carrying grass for a couple of weeks now and fly from the Dargle side, so I wonder if its some special kind of thatch/grass. On 2 occasions 5 crowned cranes have arrived in the dry dam and have not stayed very long when no water was found. Once saw 2 blue crane on the farm but have heard them quite often. Seen the female oribi on a few occasions mostly in the long grass but once on the green burn. 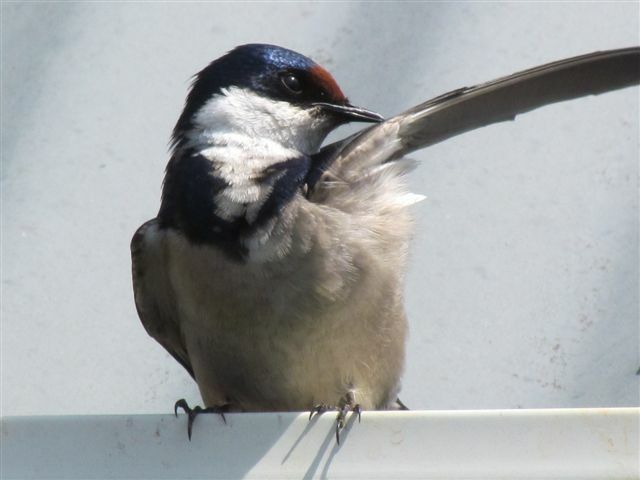 Our pair of white throated swallows arrived on the 5th Sept and are looking to build a nest on top of the verandah light again. Our sparrow hawks still occupy the canopy of gum trees. Still see them sitting on the dead gum logs in the early mornings. Saw the one eating something on the log a few days ago. Not sure if they are feeding themselves or not as have not seen the adults. Many reed buck around still and quite a few youngsters. Malachite, black and greater half collared sunbirds have returned. The malachite is the perfect model as loves his photo being taken. Not so the half collared which flits all over the place and never sits still for a minute. The gurney sugar birds are also very accommodating with photos. 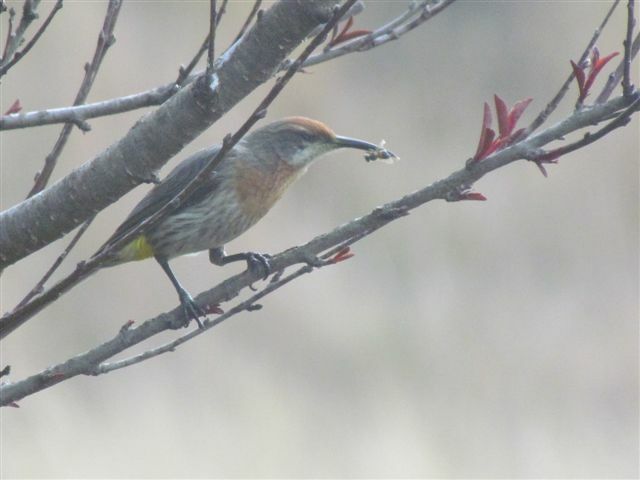 Caught the one with a hornet or wasp in its beak, beating it on the branch of flowering peach tree. Took a while but eventually swallowed it. 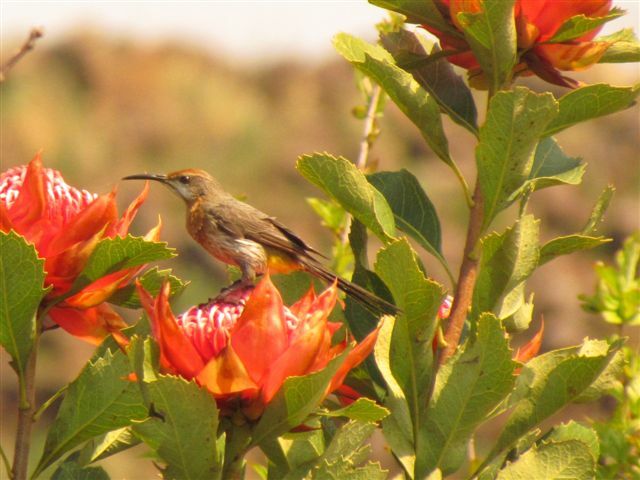 Never knew sunbirds ate insects but have seen them doing so lately in competition with the drongos and flycatcher. 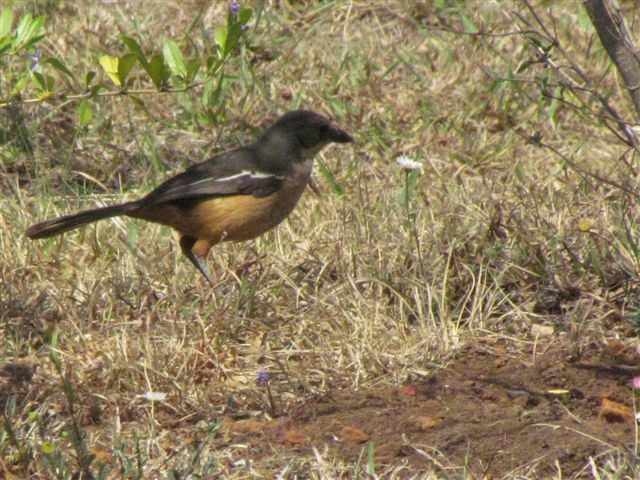 I have been listening to the cry of the southern boubou lately and decided that I would track it down. Unfortunately the pair of them live in a dense thicket of cassia bushes, so I sat one morning waiting for the special moment when they would appear. One eventually hopped around the branches – first got a tail, then a face and that was it. I know they are solitary and elusive so I was determined that one day it would happen and it did. Watching the Springbok/All Black rugby match one Saturday morning got too much for my nerves, so took the camera out to the verandah and stood looking for a few minutes. Saw a movement in the bushes and took a few photos. Thought it was the olive thrush. 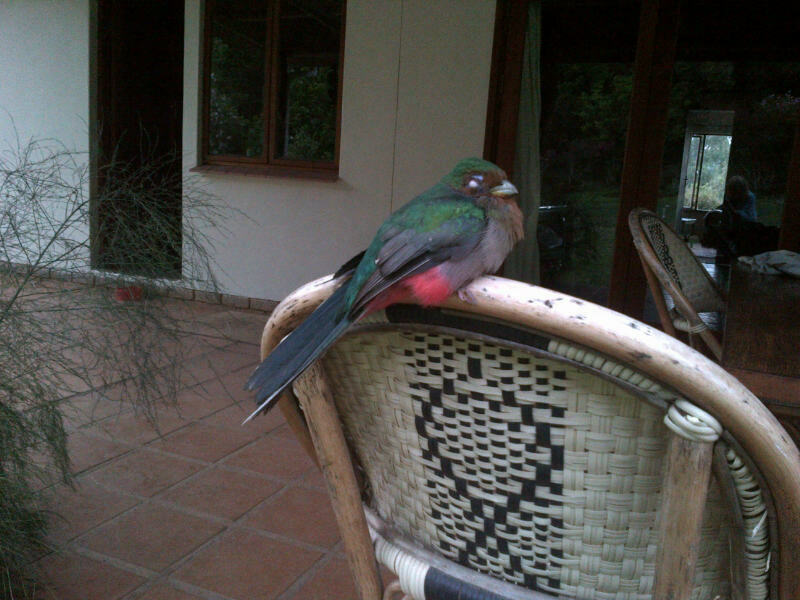 It was only when I checked out the pics after the rugby match that I howled with delight, my Southern Boubou at last. 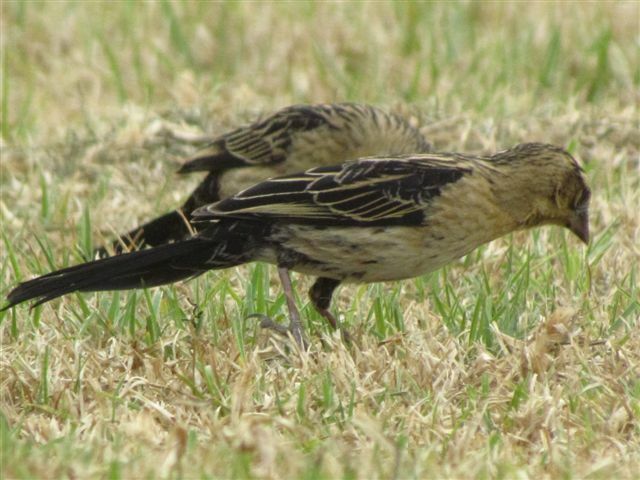 I was at a friends house looking out of her sliding doors late one afternoon, when I saw several Southern boubous hopping around her lawn quite happily, socially mixing with the olive thrushes, and I had no camera with me. I will take it with me next week when I revisit and hope to see them once again. The cape wagtail is nesting once more in the jasmine creeper but no eggs as yet. Male red shouldered widow is getting new feathers. Pat and I checked the two hollow poles where the redthroated wrynecks hop in and out of. No eggs there either. She is still calling lustily, probably looking for a mate. The barn owls have still not returned. The jackal are still very active at night. The secretary bird flew over the farm this morning but landed out of view unfortunately. Pat saw it striding out on the other side of the dam. 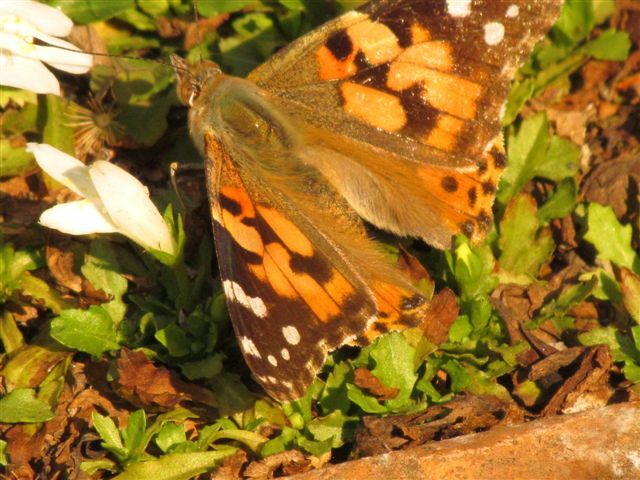 Due to the hot weather at the beginning of the month, saw a number of beautiful butterflies and some very bedraggled and torn ones too. 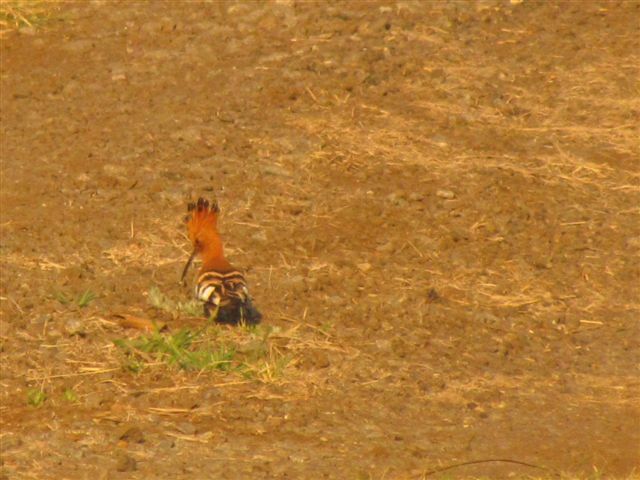 An African hoopoe also visited the garden on morning. They have nested in the wattle plantation for years, so seldom see them here. and this Morea – might it be albicuspa? Oribi During weekend of the 5th we observed 5 Oribi in the usual Oribi paddock. This is fairly normal as occasionally some of them stay on Howard’s property and don’t come across. On the weekend of the 8th we observed all 8 Oribi in the normal paddock, however on the Saturday night of the 9th we also observed another 6 Obri on the hay Paddock at the back of the maize fields on the plains above the valley that leads down to the Umgeni River. This is the first time that we had observed this “new” group of Orbi. It was the high light of our visits this month. Where they came from remains a mystery to us but we are delighted to have them on the farm as they could possibly improve the gene pool of the Oribi on the farm. This now brings the total Oribi population on the farm to 14 with 2 groups one of 8 animals and one of 6 animals. All the animals in both groups appear to be in an excellent condition. Bush Buck During this month’s visits a total of approximately 20 bush buck where sighted with an even balance of male and female. This is good news. All the animals seen both male and female are in good condition. Reedbuck During our July and August visits we observed an average of 30 Reedbuck. 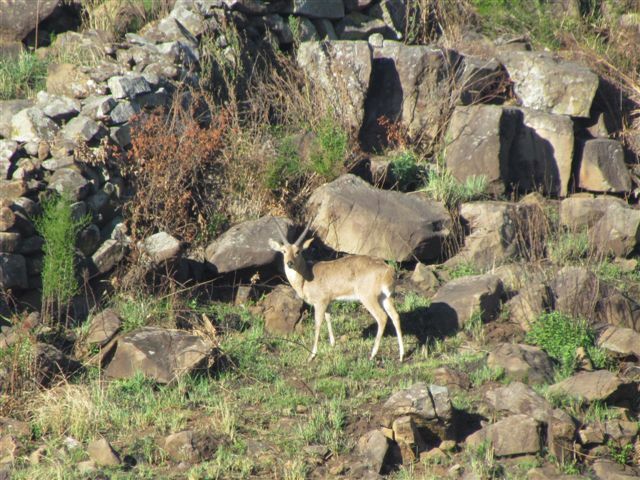 During our September visits we have only observed an average of 7 to 9 Reedbuck. The animals are surprisingly in a very good condition. Grey duiker Once again there were 14 duiker sighted during each of the September visits. The duiker population seems to be stable at this time and they appear to be in a very good condition. Most of the does seen seem to be pregnant. 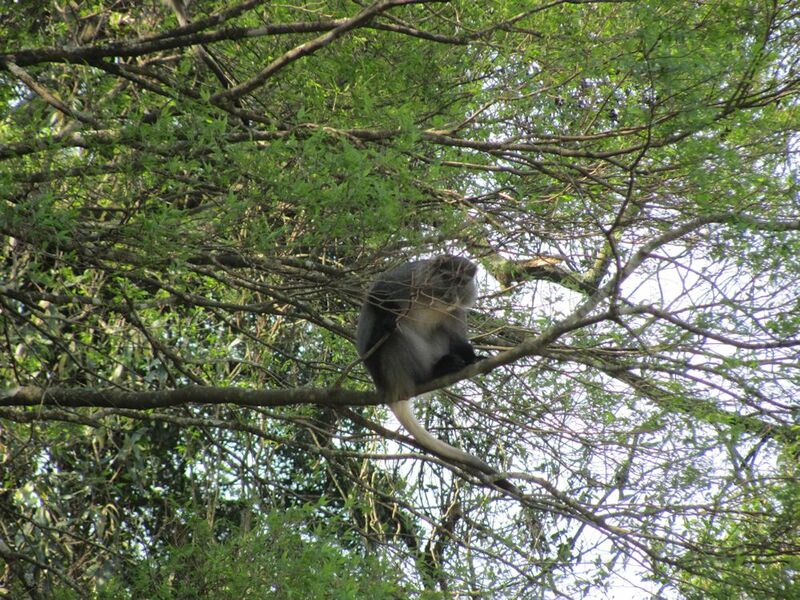 Vervet Monkey A small troop of 5 animals were sighted in the Valley near the Umgeni River. This troop has been there for a while now and it is great to see them again on the farm as the bush buck is dependent on them particularly during this dry period. Porcupine A very large ± 20kg porcupine was seen on the night of the 13th Jackals There was a lot jackal activity during both weekends of our September visits. Jackals were seen every evening during our September visits. Antbear Once again we saw the Ant bear hole in the back jackal / hay paddock. 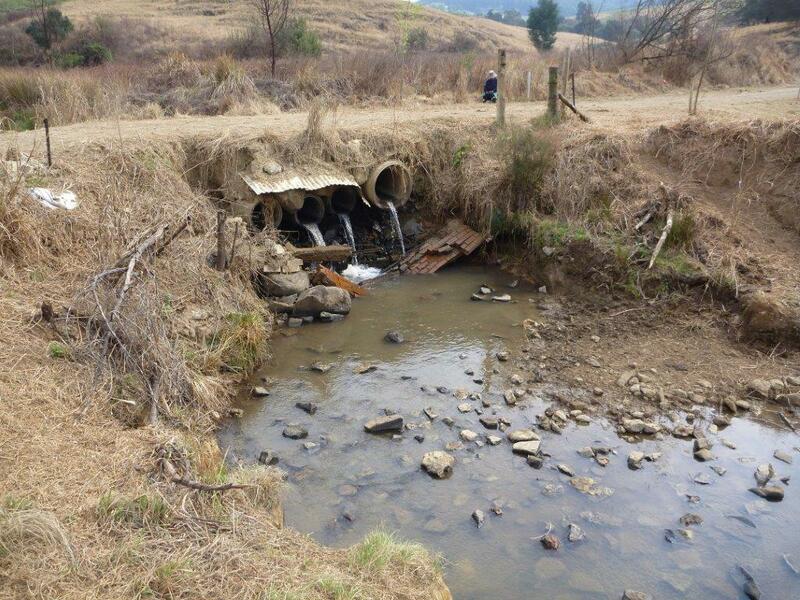 There appears to be a second ant bear hole down on the plains down by the Umgeni River. This was very exciting to see and to possibly have the second ant bear around on the farm. We will continue to monitor these holes and hopefully see both of them at some time. Blue Crane Several blue cranes were seen during both weekends. Spurwing Geese Over last few visits we have noticed that this year there has been a dramatic increase in the Spurwing goose population. A flock of 10 geese is not uncommon now. It is very nice to see that their numbers have finally increased. Egyptian Geese The Egyptian geese population on the farm has also increased over the last few months which was also very pleasing. Several flocks of geese can be seen flying around almost all day. Herons Several Herons were seen all over the farm during this month’s visits. Guinea Fowl It is pleasing that the guinea fowl population has increased dramatically over the last few months. During both weekends we saw a flock of some 50 birds. This is the most we have seen in many years. Their population seems to be stable at this stage with a similar number of birds counted during the visits last month. Grass Owl During both visits this month we had the amazing privilege to see a grass owl as these are endangered. Francolin During this month’s visit no Francolin were seen, but many were heard. This is not uncommon as they do tend to stick to forested/wooded areas and are masters of camouflage. Pigeons There appears to be a reduction in the number of pigeons and doves around at the moment, but this is probably normal considering that the maize crops have all been harvested now and there is a clear reduction in food around for them. Owls A few barn owls were seen near the top end of the cross road forests. As a whole the owl population does seem to be on the increase at the moment. Olive Thrush There are a lot of olive thrushes around on the farm at present. Once again several jackal buzzards and crown eagles were seen and an overall increase in raptors was seen. A large population of swallows were seen almost everywhere on the farm. 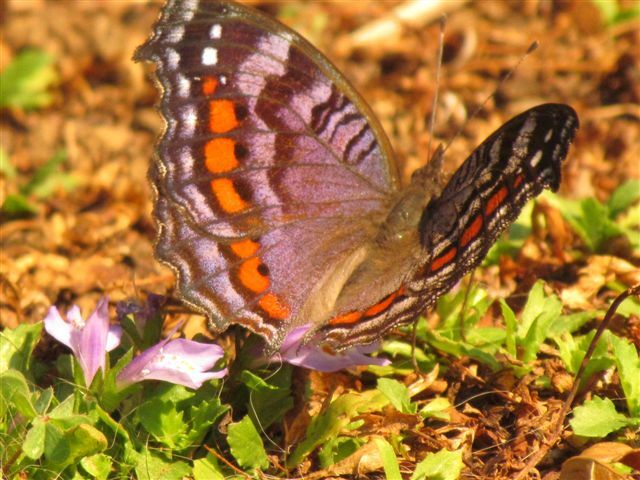 This entry was posted in KZN Midlands Wildlife and tagged birds, butterflies, dargle, grass owl, indigenous plants, malachite sunbird, narina trogan, oribi, samango monkey on September 29, 2014 by Midlands Conservancies Forum. 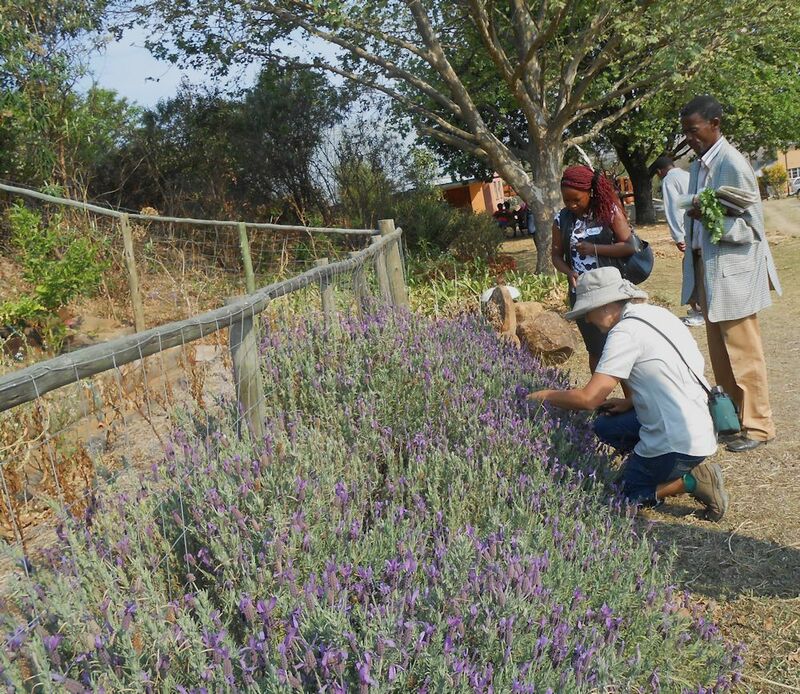 The Mpophomeni Conservation Group arranged a visit for supporters to the Khula Shanti Sanctuary and Food Garden in Boston recently. 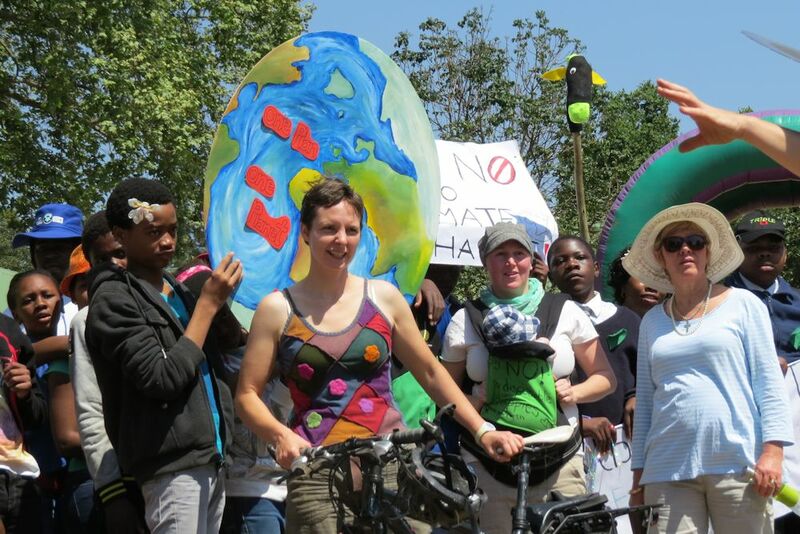 Thanks to the Global Green Grants Fund and N3TC for sponsoring the inspiring day. 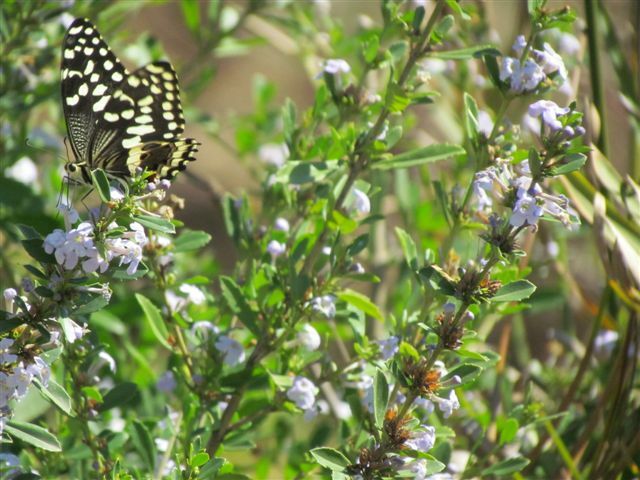 Carol Segal reports: We were given the most glorious sunshine day to enjoy the splendour of Khula Shanti Sanctuary. 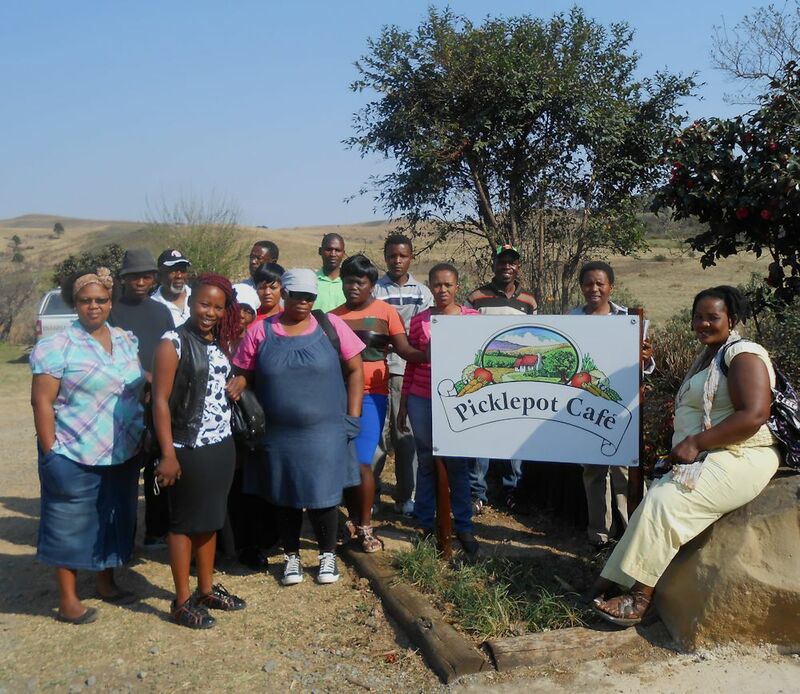 A group of 15 beautiful beings arrived at the Pickle Pot Café. We introduced our staff and our dogs. 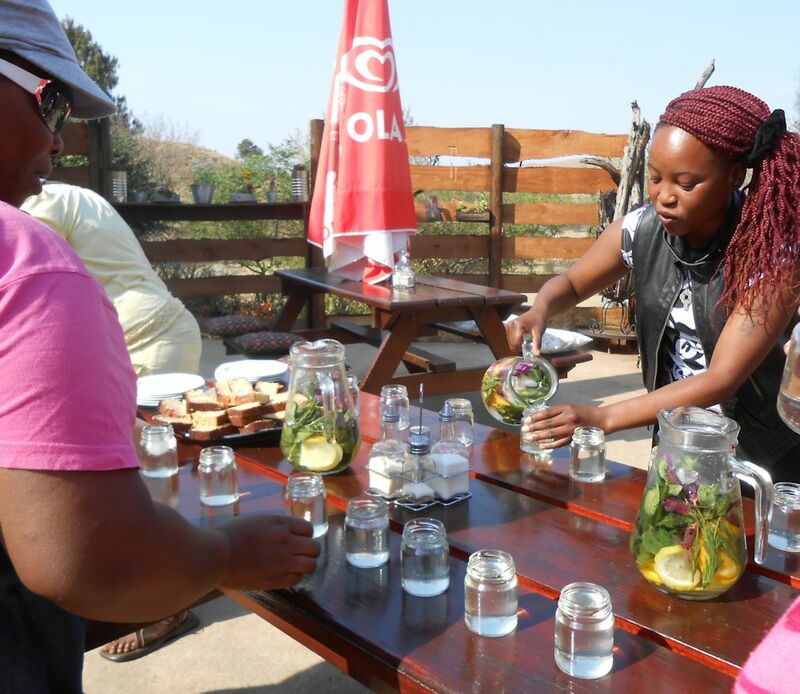 We refreshed ourselves with fresh spring water, infused with lavender flowers, mint and orange slices and munched on just baked carrot and banana bread. All systems charged, walking shoes on and time to explore the forest. The forest walk was an enlightening success, the feedback at the end of the day revealed that this was a first time experience for many of our visitors. We had the opportunity to observe and talk about biodiversity, planting in guilds, forest mulch, eco-systems, habitats and conservation. 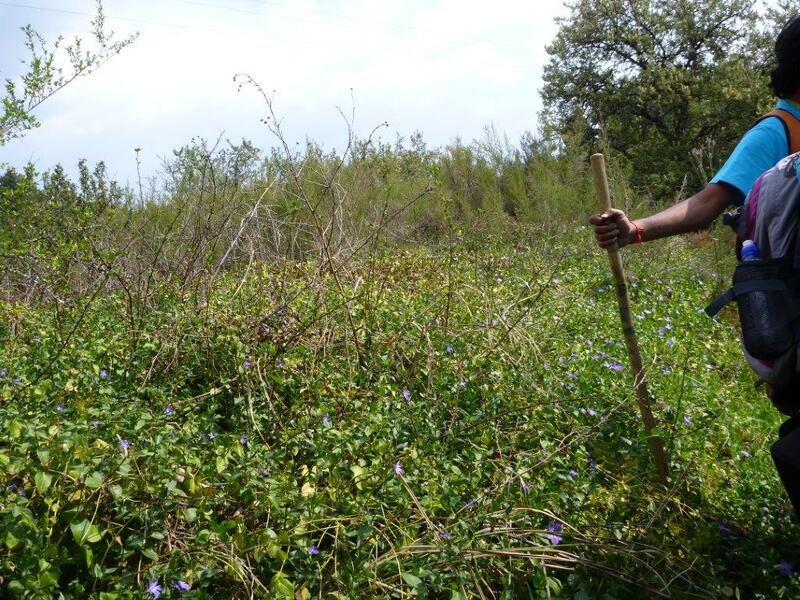 The abundance of Podacarpus trees in the Khula Shanti Forest sparked discussions on national trees, animals and flowers. The idea of a national tree was new knowledge for some visitors, and many took to spotting all the Podacarpus along the walk. Our precious finds for the day were some fresh samples of duiker droppings, porcupine droppings, as well as a magnificent feather which we are almost certain belonged to an owl. 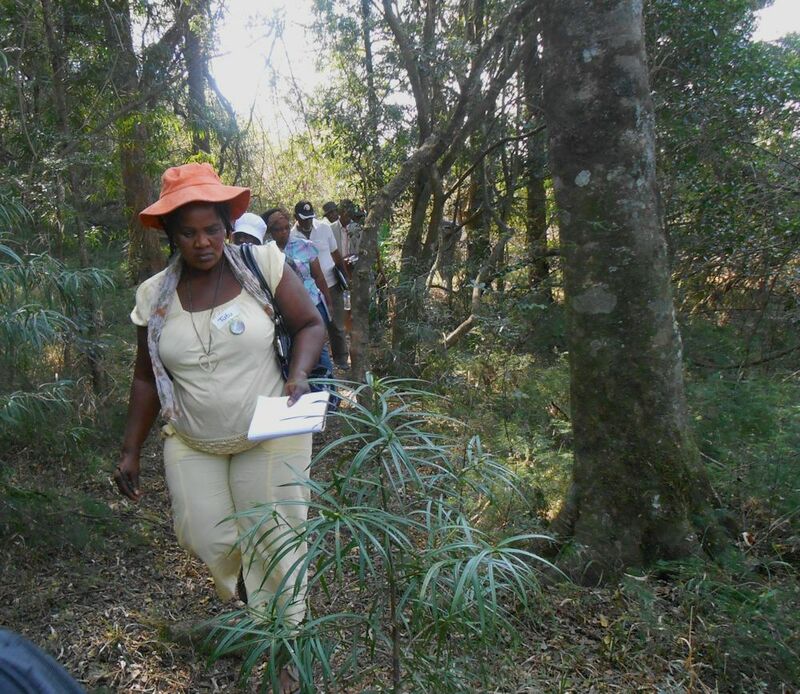 Ntombenhle shared some valuable insights on bugweed removal and the problems of alien invaders in our natural forests. 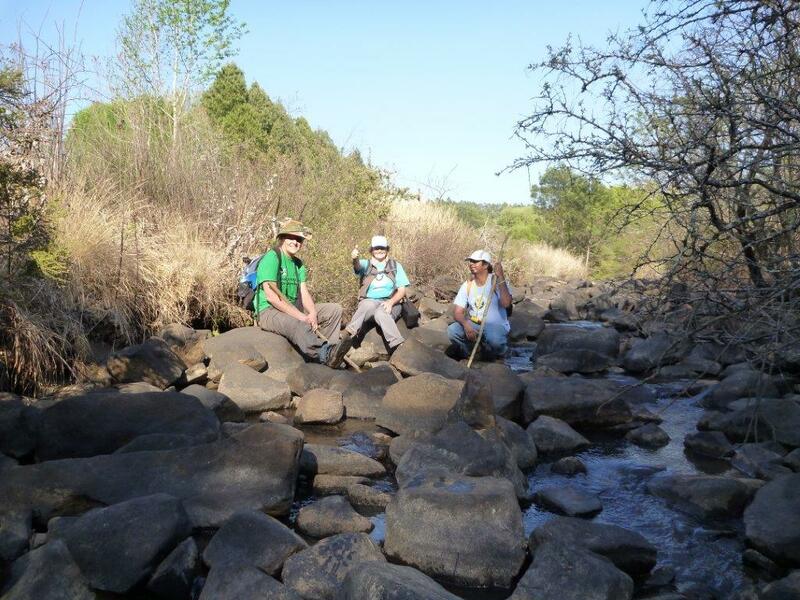 Carol comments “she bubbles energy and optimism which was contagious for the group.” Tutu loved learning about the importance of rocks in the garden and left inspired to rehabilitate the eMashingeni forest at the top of the Mpophomeni valley. The forest walk is a fairly steep incline for some, so many were pleased to see the cheerful welcome of the bright and happy floral food forest garden. We spent the first 10 minutes of our time in the garden, walking around silently, observing feeling the Khula Shanti Food Gardens. 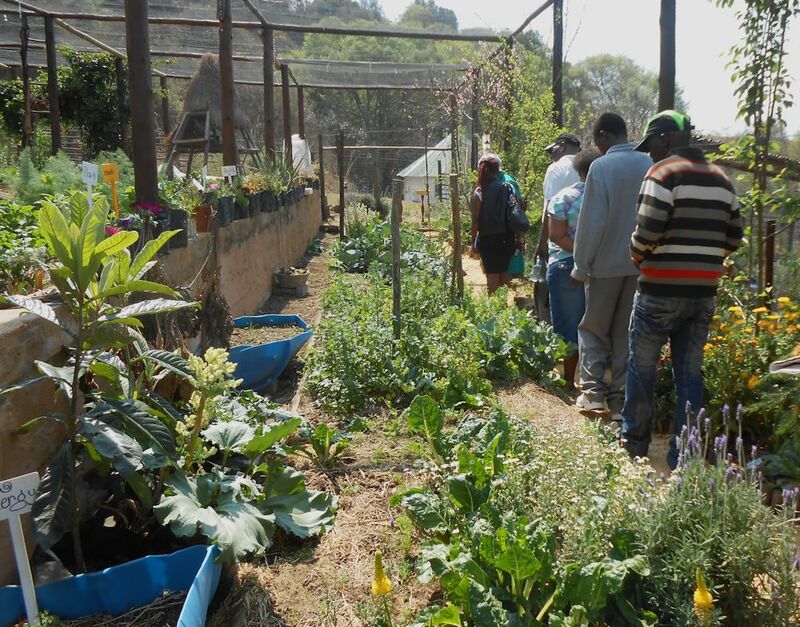 We then opened discussions around what new knowledge could be taken from the food gardens. 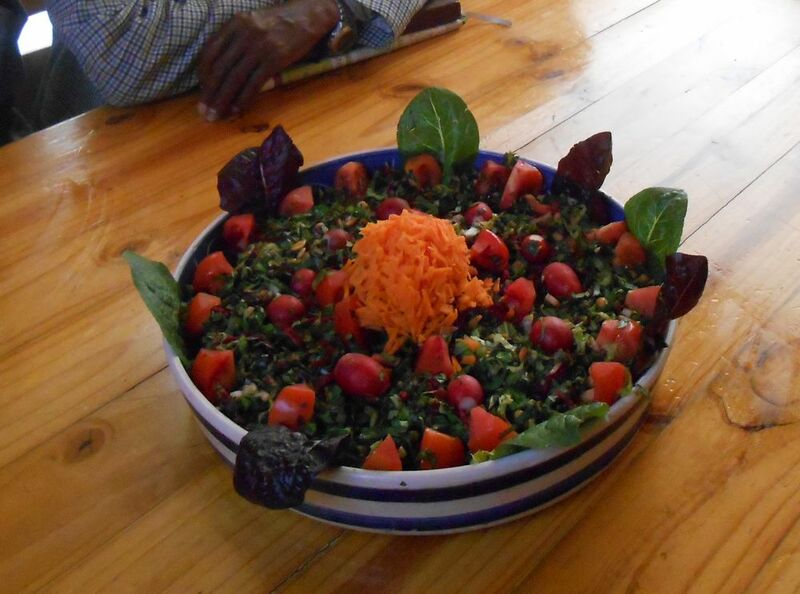 The cucumber and pea pyramid, the chicken tractor, rock pathways, circular beds, companion planting, Vermiculture, compost making, comfrey tinctures, mulch and tea trees are only a few of the discussions we shared. 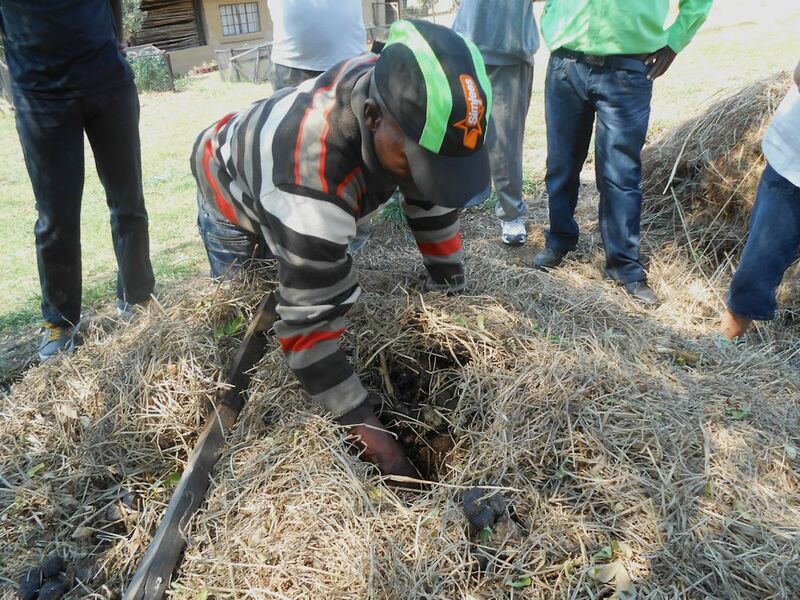 Skhumbuso dug his hands into the compost heap and filled them with rich moist compost teaming with red wriggler worms. Everyone was pleased to hear that goat and horse manure is fantastic for the compost heap. Nqobile was most impressed by the idea of worm wee. “I still don’t believe what I saw. 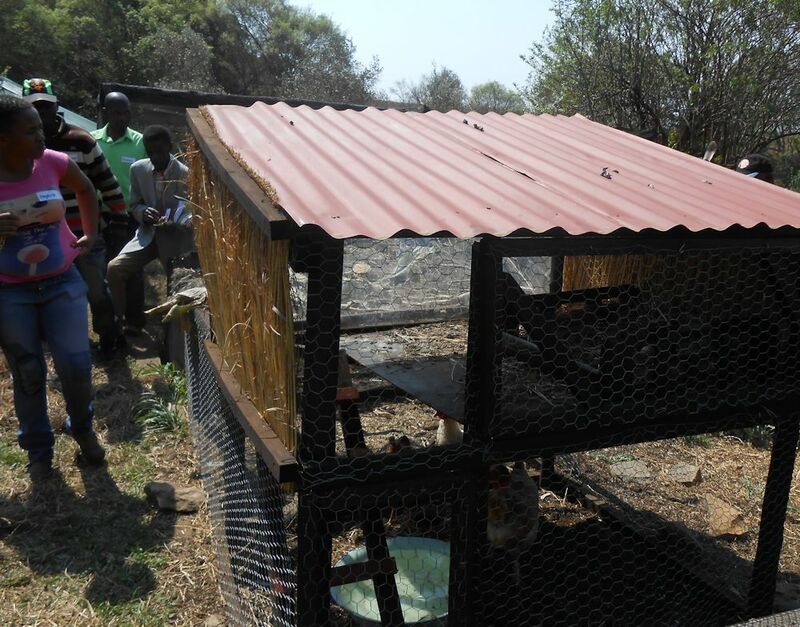 The chicken tractor, the indigenous forest. This is the first time I have seen these things and it is wonderful.” The Khula Shanti Chicken tractors were the source of much curiosity and questioning. “I’m going to try this at home” she said. It was encouraging to observe the contagious enthusiasm and tangible inspiration while people were browsing, grazing, sniffing and tasting the sensory explosion of the food garden. 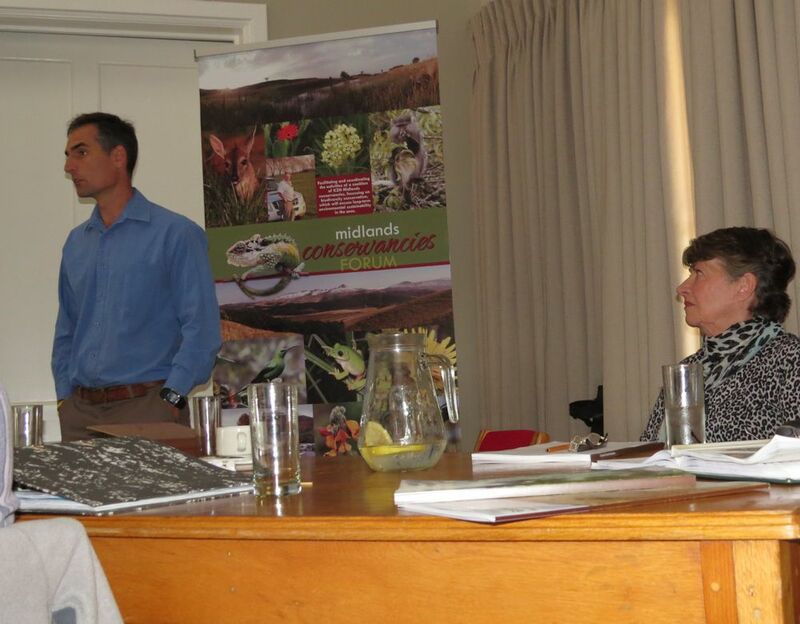 Questions around seed saving, seed-plug propagation, succession planting were answered. 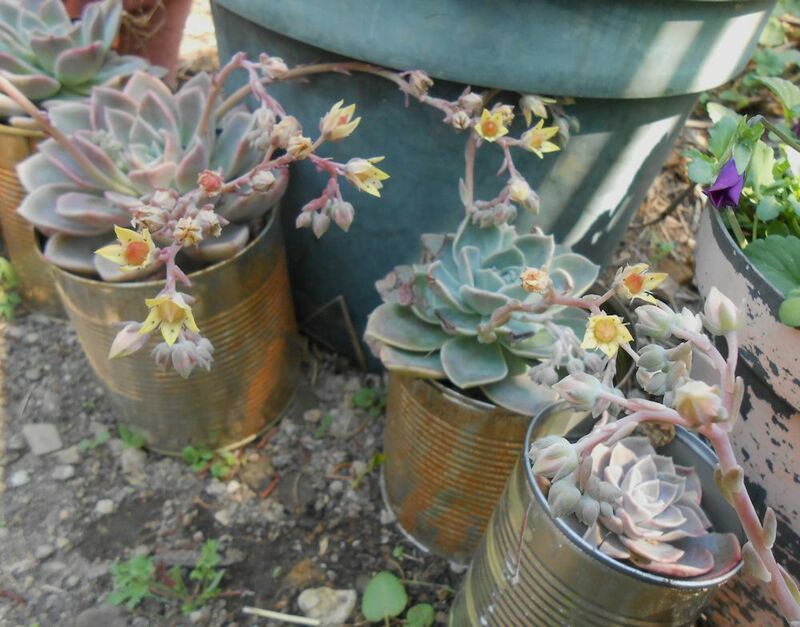 Gertrude liked the idea of using old cans to grow plants in “Tomorrow I am going to collect all the scrap around my place to use.” she said. 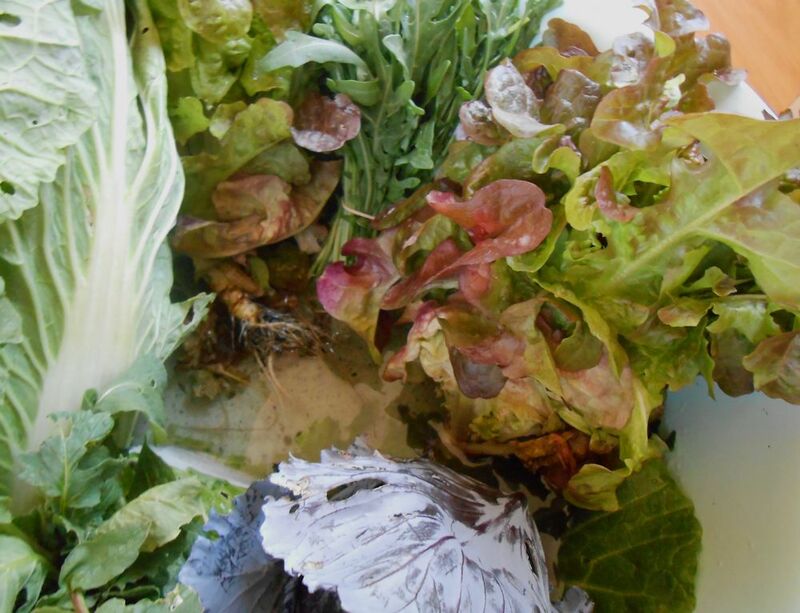 We divided ourselves into two groups to pack 2 food box orders – went back up to the garden to select, pick, wash and prepare the orders. This was a fun and hands on activity which could be further expanded in the future. 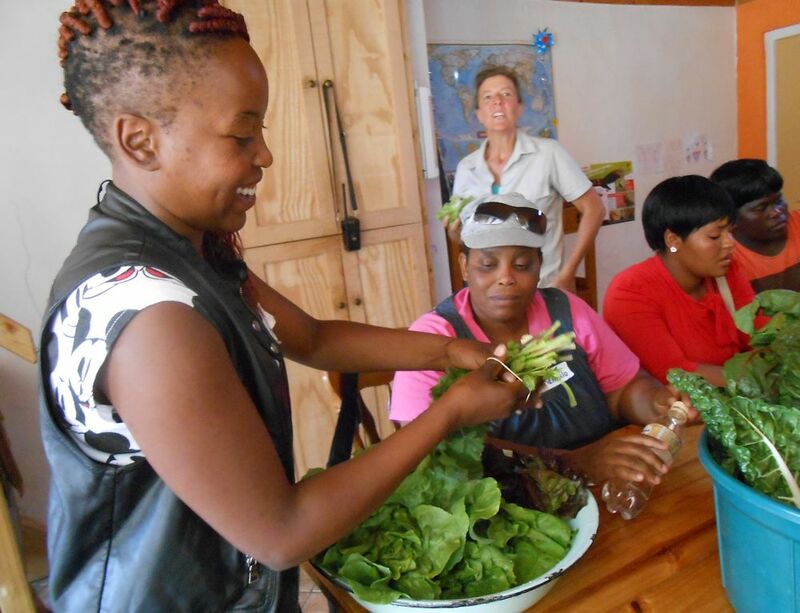 For many visitors new learnings were – variety of vegetables and herbs, presentation of vegetables before selling them, pricing and packing, where to sell and who to sell to. When discussing the possibilities of starting a food box scheme, Carol shared the obstacles she has faced and also reminded the group of the importance of co-operatives as well as the danger of over-promising and under-delivering. We shared ideas around how to successfully start a business and start small rather than big to ensure a steady supply as well as to be reliable in quality as well as quantity of produce. 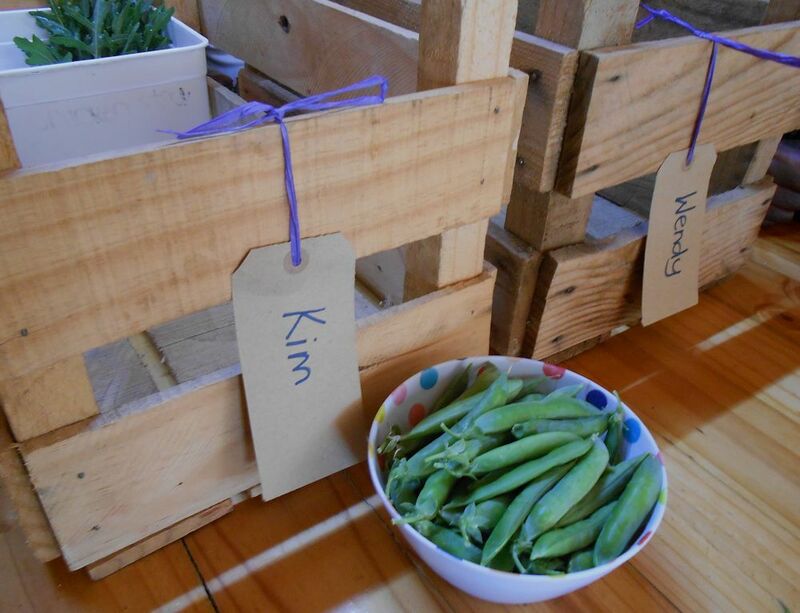 The food box packing demonstration was well received, everyone participated and much was learnt, including how to pick and eat peas before packing them. Finally, time to feast. 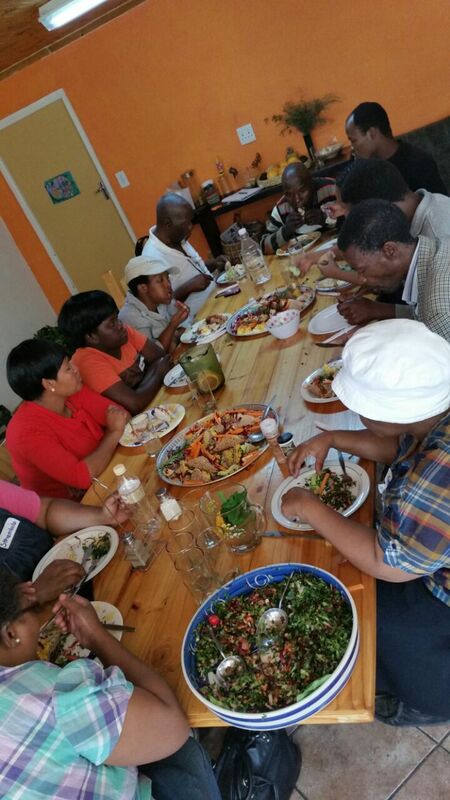 We shared briefly about nutrition and the importance of eating foods from our gardens and raw food first. We closed our day with a feedback session on what new learnings had been received and where people would like to go to from here. 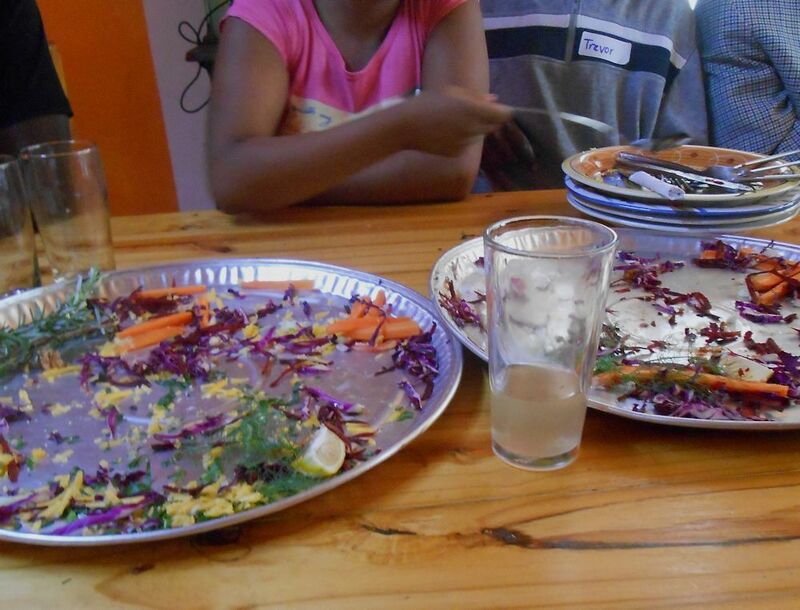 This entry was posted in Environmental Learning, Sustainable Living and tagged biodiversity, Boston, food garden, forest, mpophomeni, permaculture, sustainable living on September 25, 2014 by Midlands Conservancies Forum. 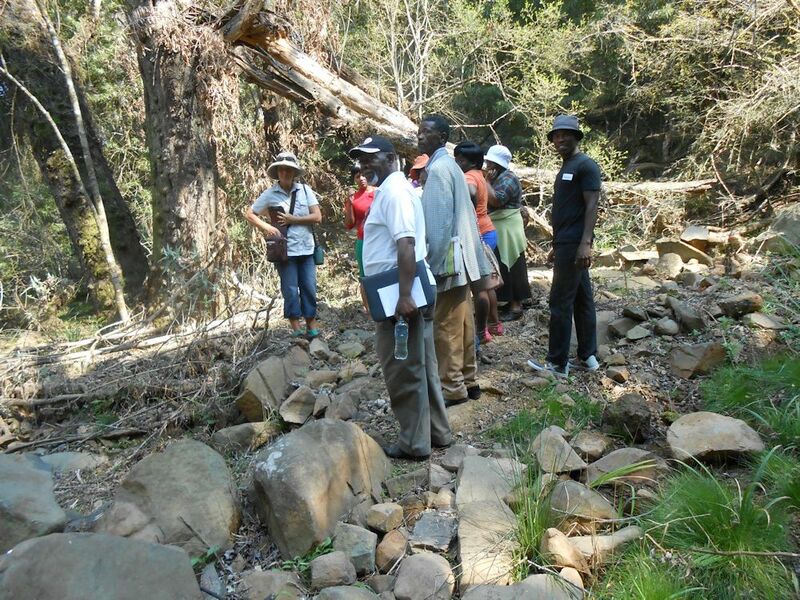 Members of the Midlands Conservancies Forum gathered in Balgowan recently to explore Milestone Forest and learn more about the fate of the Mpofana River. 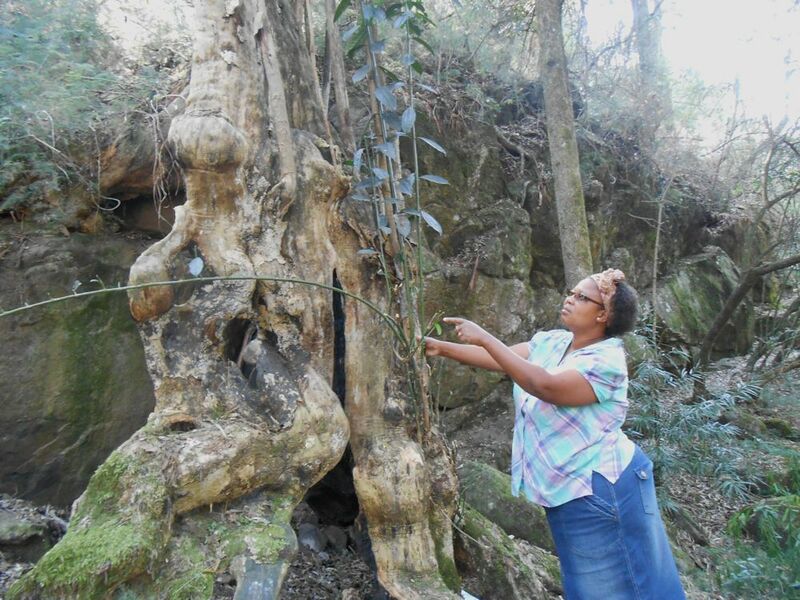 It was the ancient Yellowwoods of Milestone that inspired the first Conservancy in South Africa – formed right here. Walter Addison shared some of the history of how they came to be here (survivors of the last ice age) as we gazed in awe at the giant trees that form the ‘Cathedral’. 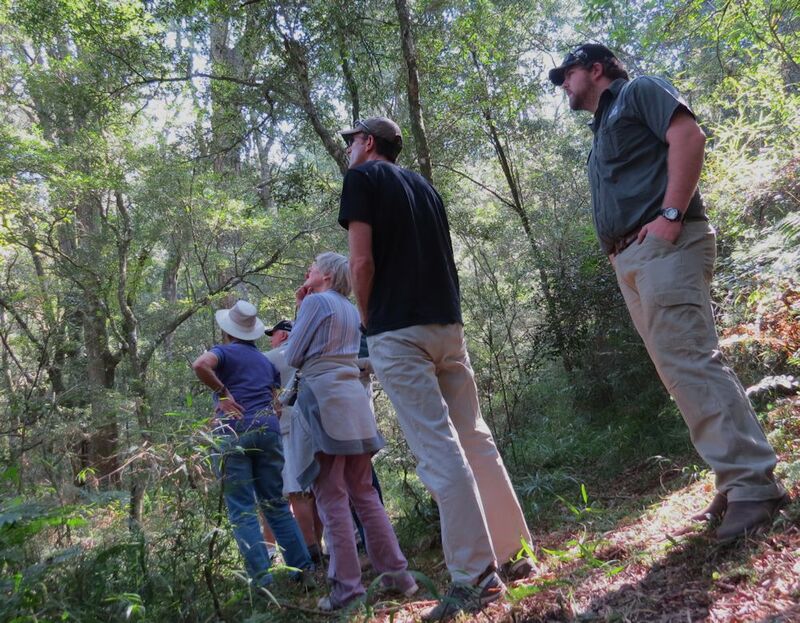 Balgowan Conservancy hosts a guided walk in this forest on the first Friday of each month. It is well worth a visit. Contact Marilyn on 082 427 3365 to book. 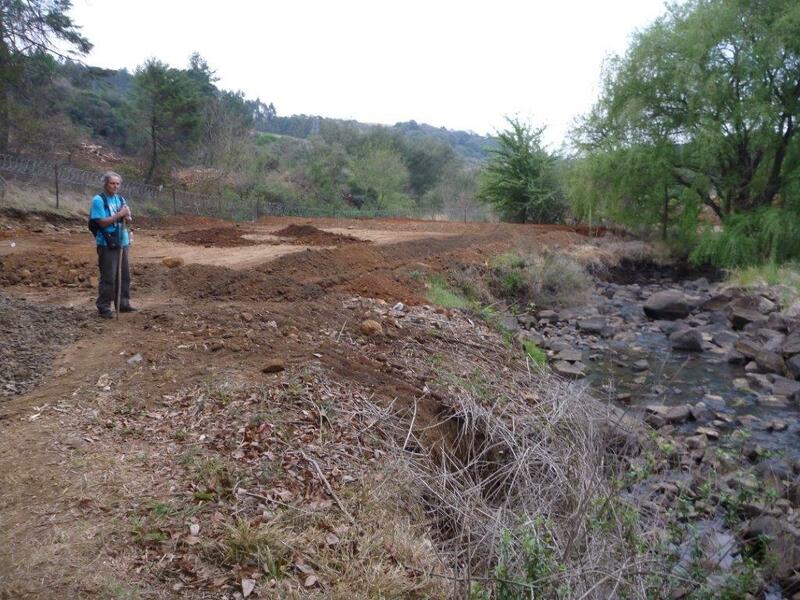 As we drove back to Michaelhouse we passed the spot where the water release/outfall from the new Spring Grove Dam will enter the Mpofana river. We had invited Kate Fenenga of TCTA to address our meeting on the impacts the Spring Grove water release will have on the Mpofana, but she was not able to unless we submitted all the questions we might ask beforehand. 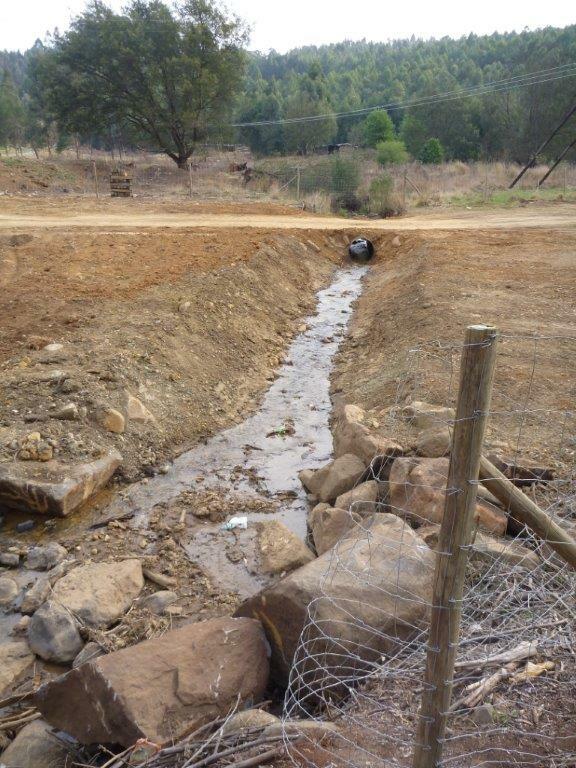 Instead we had Kevin Meier from Umgeni Water share their operating philosophy of Spring Grove Dam. This was really interesting. He told us that the uMngeni river catchment is now completely utilized and that we cannot build any more dams on these rivers. 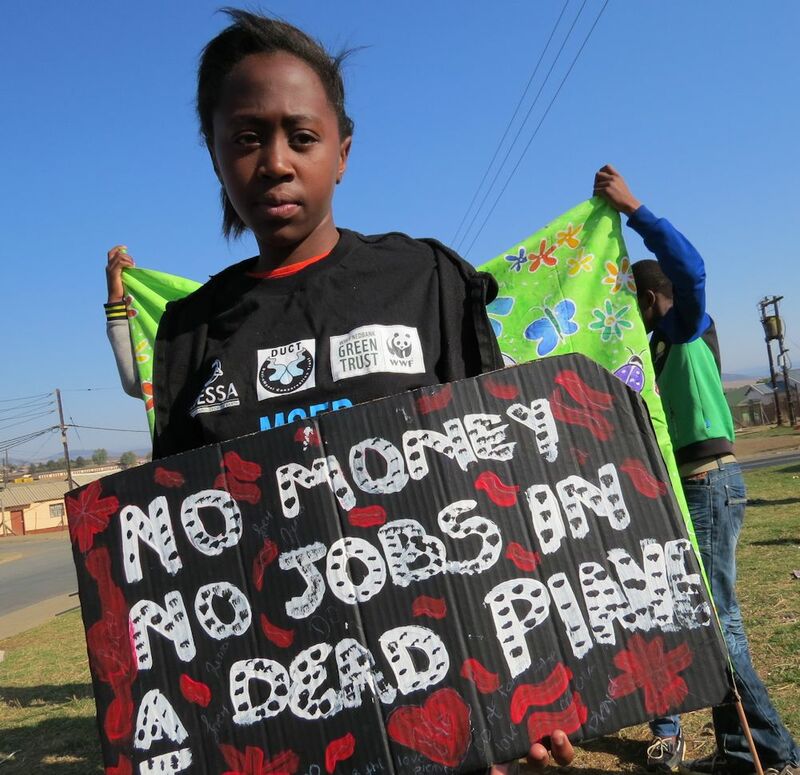 Their job is to supply water to the municipalities. 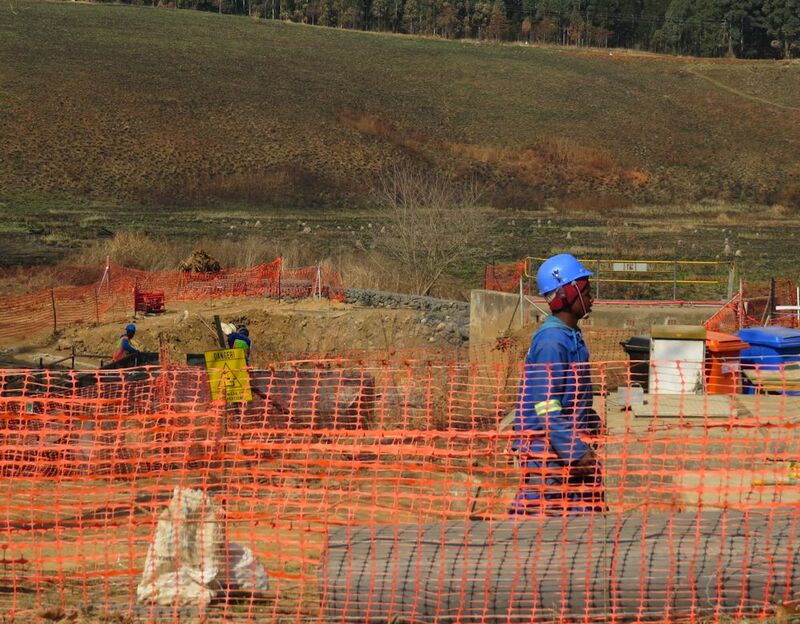 They pump as much as possible to keep Midmar and Albert Falls dams full and watch the weather closely to stop pumping when rain is imminent. 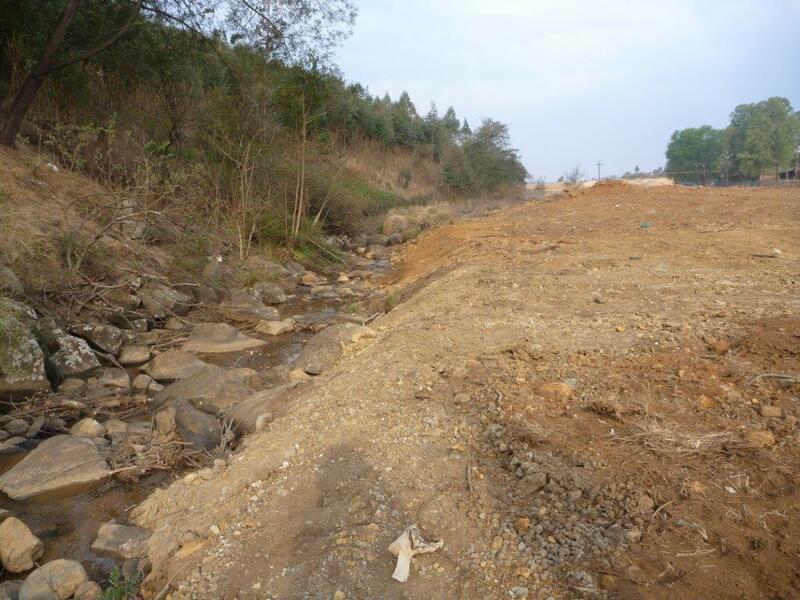 Obviously, we were most concerned about the impact of more water on the Mpofana river as the Mooi Mearns Transfer Scheme (MMTS) had already had a negative impact according to some of the landowners present. Kevin said “We believe we can release 4,5 cubic metres per second without impacting the environment.” Currently they transfer 3,5 m3 in the wet season (about 3 months of the year). 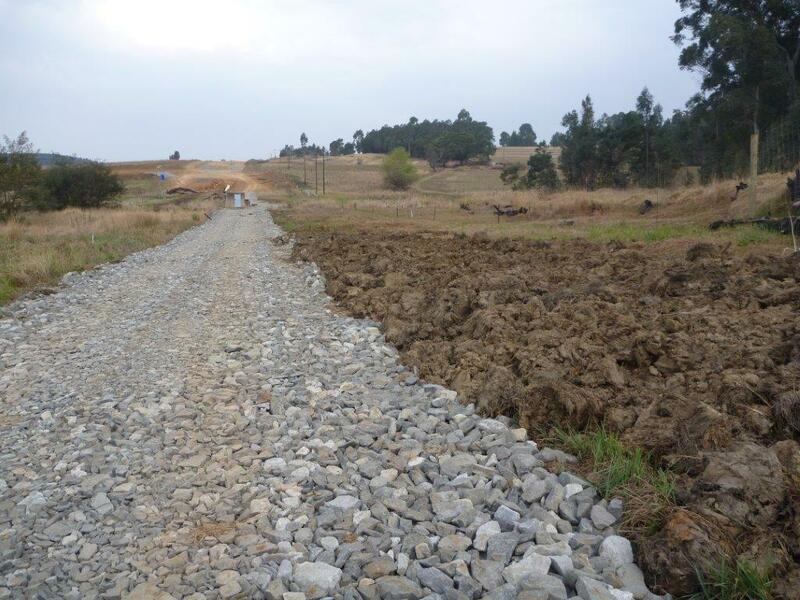 Once the new pipeline is in they will increase transfer to maintain continuous minimum flow of 4,5m3 although pipe capacity is 5,4m3. 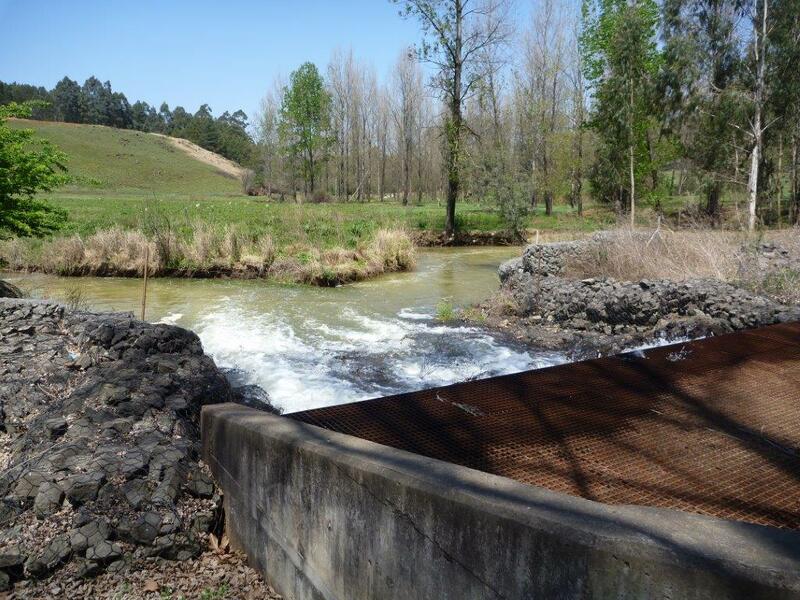 The thinking is that the river will adjust from minimal basal flow to 4,5m3 over the first year or two of operation. We were aghast to hear that this release will continue throughout winter when the normal river only has about 1 cubic metre per second of water. No doubt this will impact negatively on the health of the river. 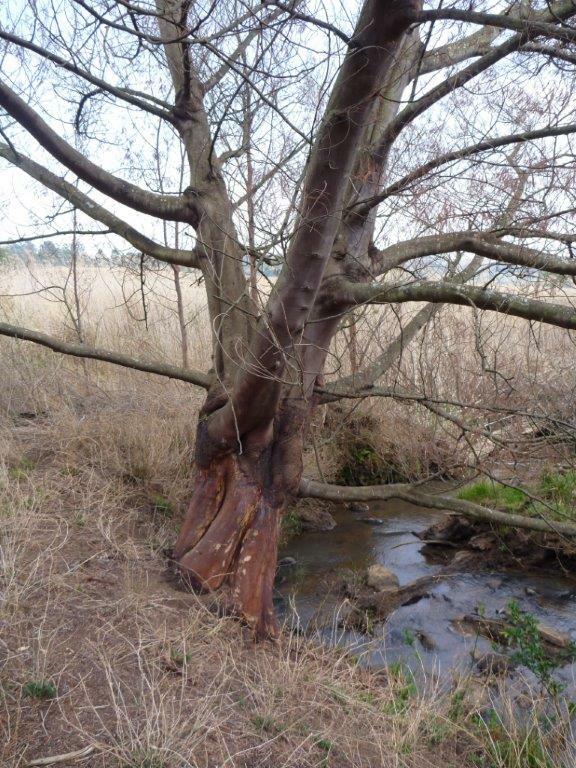 Balgowan Conservancy members whose properties have already been affected by the raised levels of water in the Mpofana (from the Mooi Mearns Transfer Scheme) asked questions about their causeways, river banks and bridges. 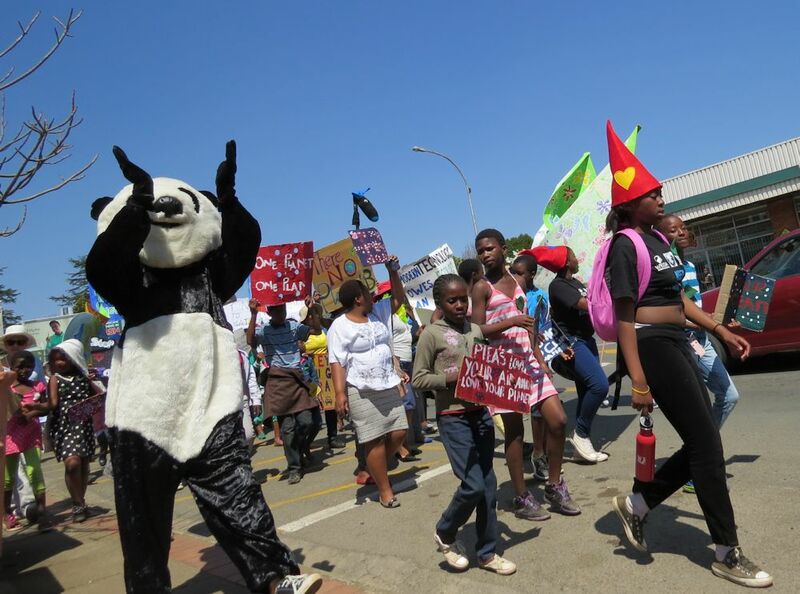 Kevin suggested that most of these concerns needed to be addressed by DWAF, not Umgeni Water. Apparently the Dept of Water Affairs is about to conduct a survey of the entire Mpofana and Lion’s rivers. 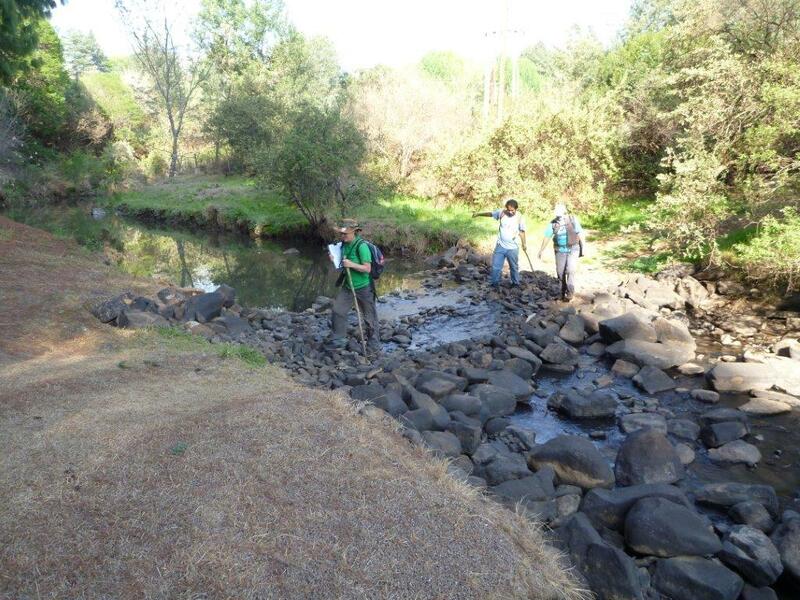 It appears that their main focus is on erosion of the river banks, not the ecological health of the riparian zone. They assume that the river will realign itself. 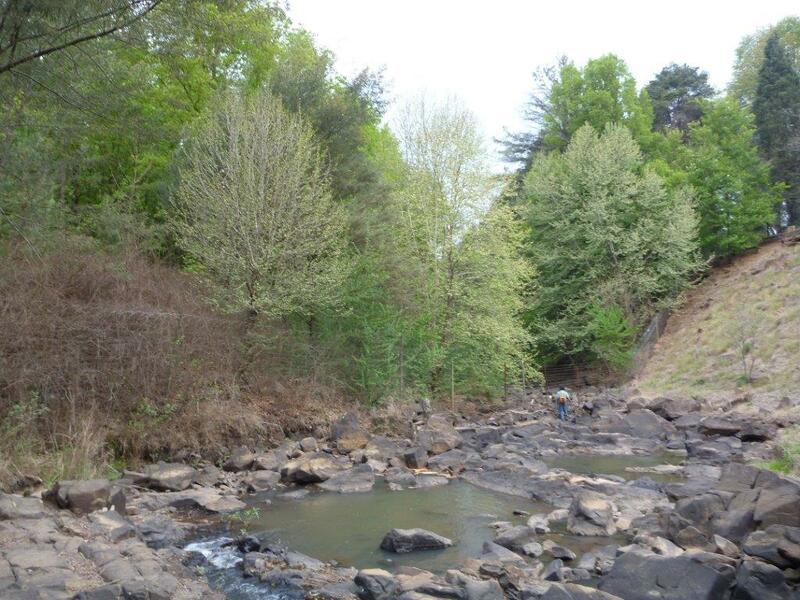 SASS surveys will be conducted four times a year above and below the outfall to monitor the impact. Kevan Zunckel was up next. 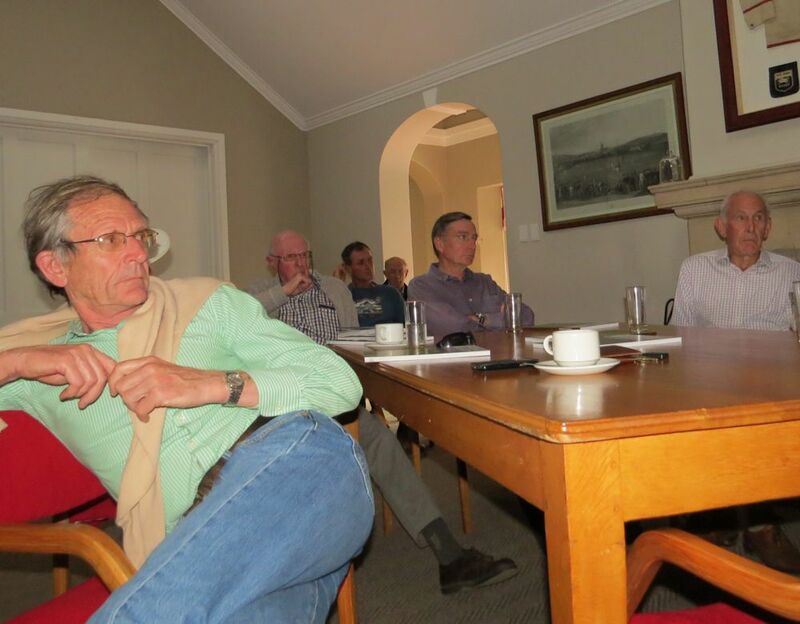 Kevan has done extensive research the negative affect of dams in general and the importance of keeping our rivers intact and shared some fascinating information with us, relating to the points Kevin Meier had raised. 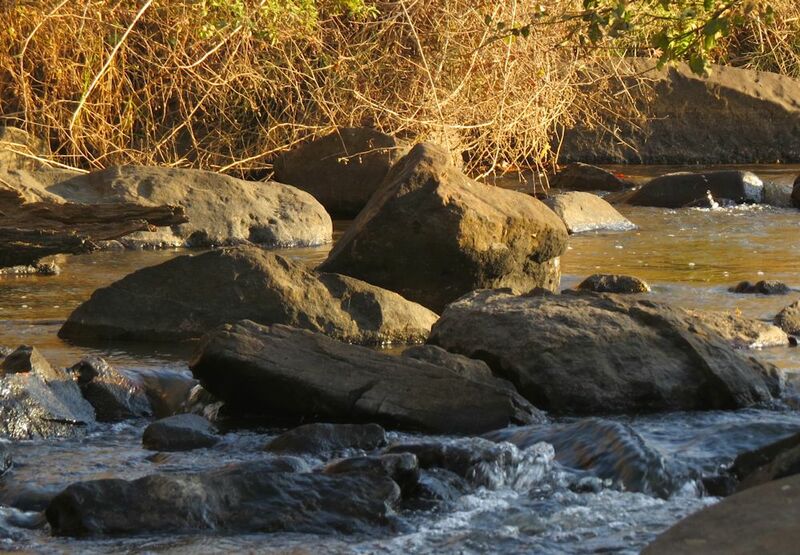 It is currently costing Durban R100 million to treat water – Durban’s current water treatment bill is approximately R100 million per month and based on the findings of the uMngeni River Walk where the water quality improved from extremely poor to natural below the Albert Falls Dam as a result of riparian vegetation restoration, it can be calculated that it will cost 10% of the monthly water treatment spend to replicate this restoration work along the entire length of the uMngeni River’s main stem. This would lead to the creation of hundreds of jobs and a reduction in the treatment costs. Both the Lion’s and Mpofana rivers do an excellent job of assimilating impurities. These tributaries are highly sinuous, i.e. they meander extensively, with associated flood plains and oxbows. 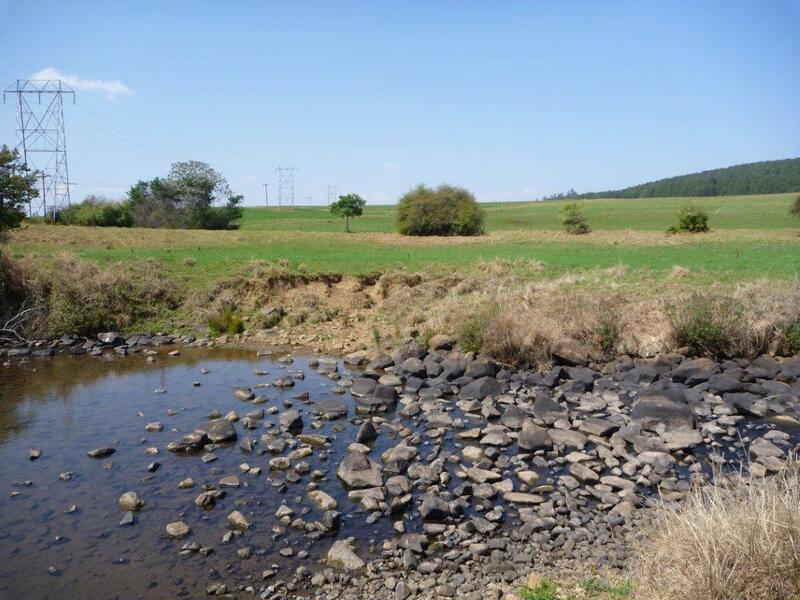 This gives them the potential to assimilate both sediments and impurities as the actual length of the channels is significantly longer than the direct distance between a source of pollution and Midmar dam (as the crow flies). The nutrification of the big dams – this would be “eutrophication”, i.e. the artificial or accelerated increase in nutrients coming from intensive agriculture. 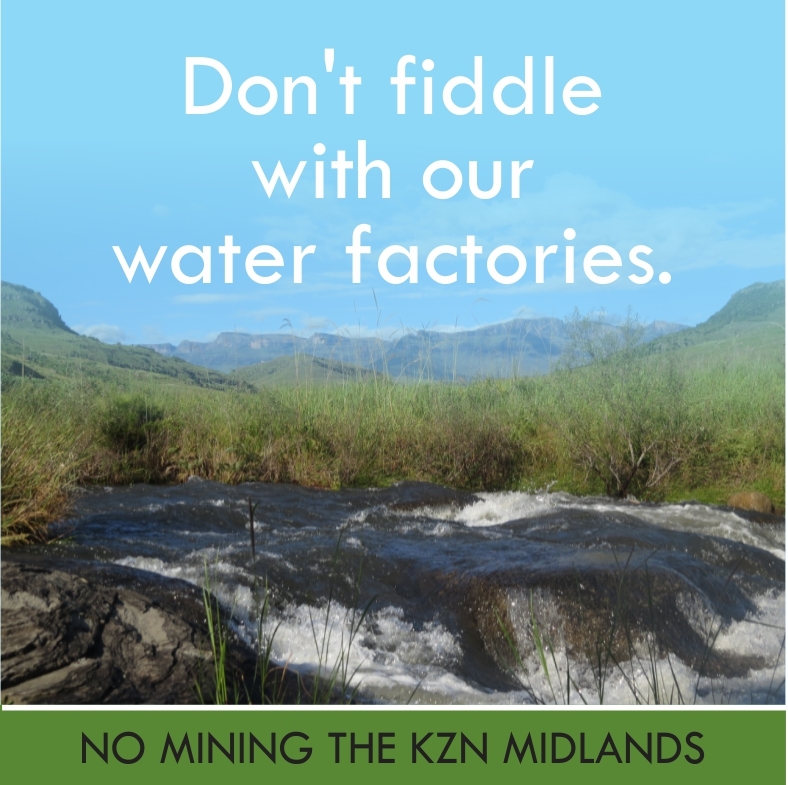 We know that the Lions is not in good condition and has a dense concentration of intensive crop and animal production activities along its banks and in the catchment, and now that the MMTS-2 is coming on ‘stream’, the added impurities from the Mooi system will exacerbate this situation. 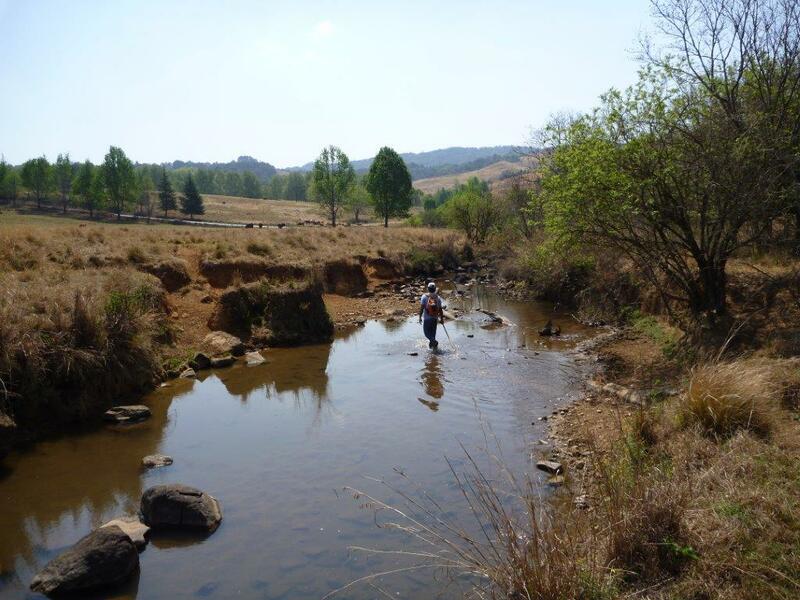 Although Umgeni Water’s water quality monitoring suggests that the Mooi and Lions are in pretty good shape, it is possible that with a little more intensive monitoring a different picture will emerge. Penny’s walk of the Lions showed this to be true. 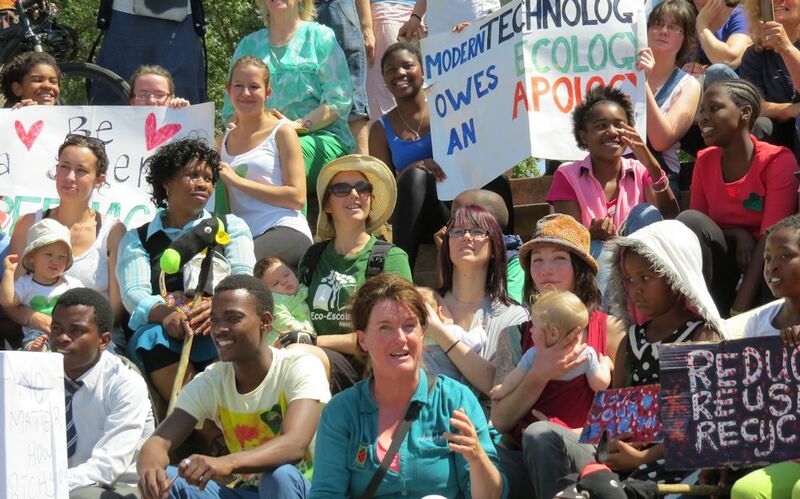 Without the MMTS-2 I have been told that the prediction for Midmar’s eutrophication to similar levels as Hartebeespoort Dam, was between 15 – 20 years. Now with the MMTS-2 adding to the system, it is predicted that this may happen in 10 to 15 years. 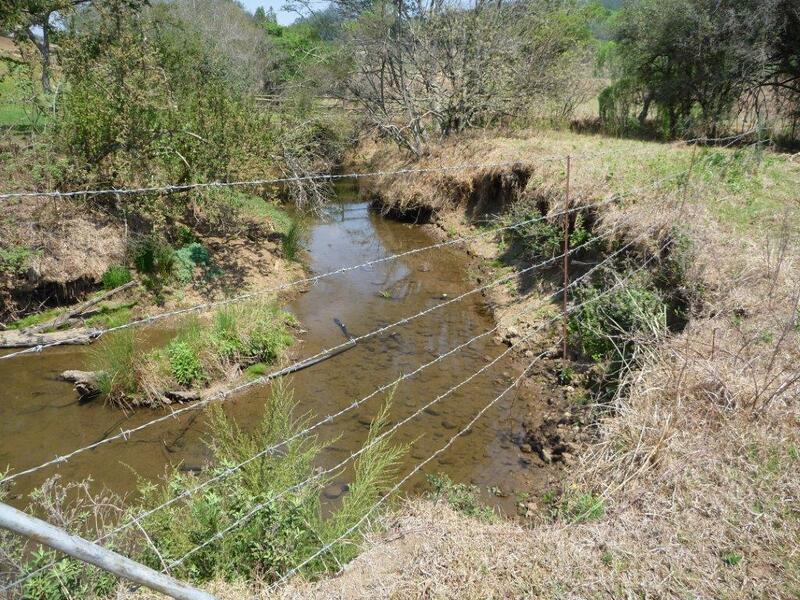 Inanda is already showing signs of algal blooms in the upper and mid sections, but its depth and convoluted shape allows for this to be dealt with by the time it gets to the lower end where the raw water is abstracted. 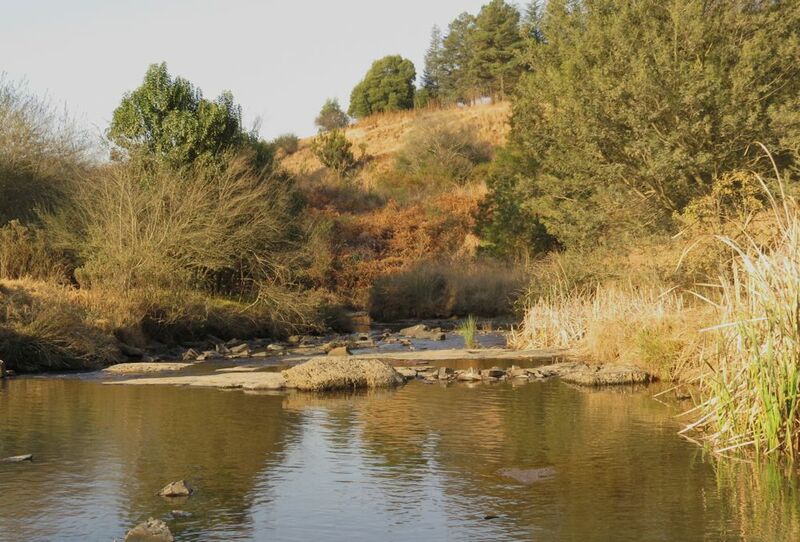 So it is not a water quality and treatment problem as yet, but in drier years when the concentration increases, it could well reach the threshold from which it tips across to the Hartebeespoort type of situation. Ecological infrastructure has the capacity to do wonderful things with our messes, but if we push the systems too far, then we will exceed this capacity and lose the ecological services. 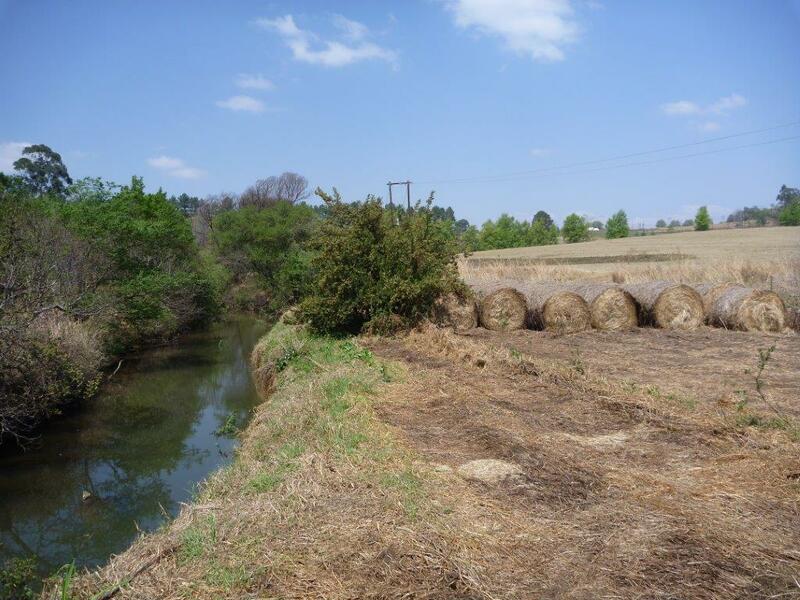 Intensive agriculture can work with ecological infrastructure if it recognises the value of the services and respects the thresholds, otherwise that is when the R100 million/month bills begin to emerge. As we left, a Spotted Eagle Owl nest with a couple of chicks was pointed out to us in the car park – beside the busy rugby field! Despite the handy ledge that was built especially for them, the noise must have annoyed them after a while – or perhaps the heated debate at the MCG gathering was the final straw? They have now all moved to the Rectory garden where they are thriving. Nature certainly is resilient and adaptable, but as Kevan Zunckel said – it is about thresholds, sometimes we push Nature too far. Then we will all suffer. 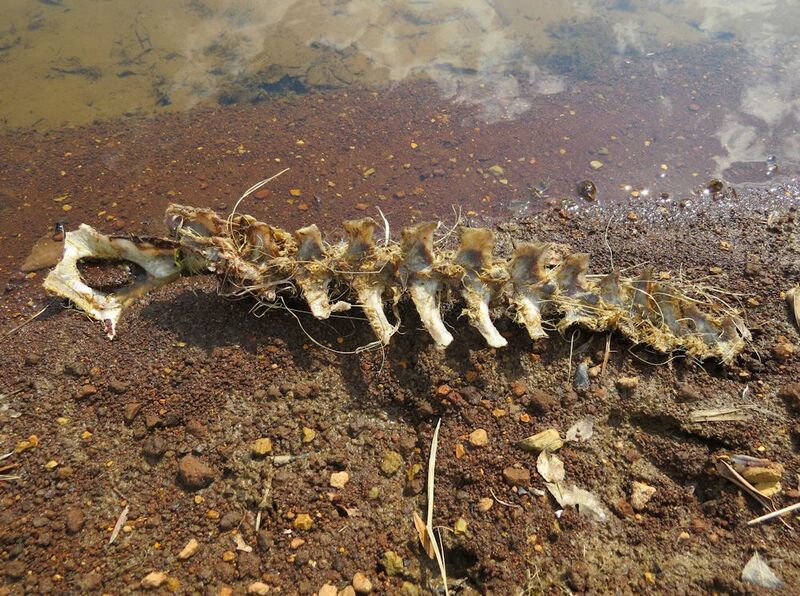 This entry was posted in Environmental Issue and tagged balgowan, mpofana, river, spring grove dam on September 23, 2014 by Midlands Conservancies Forum. 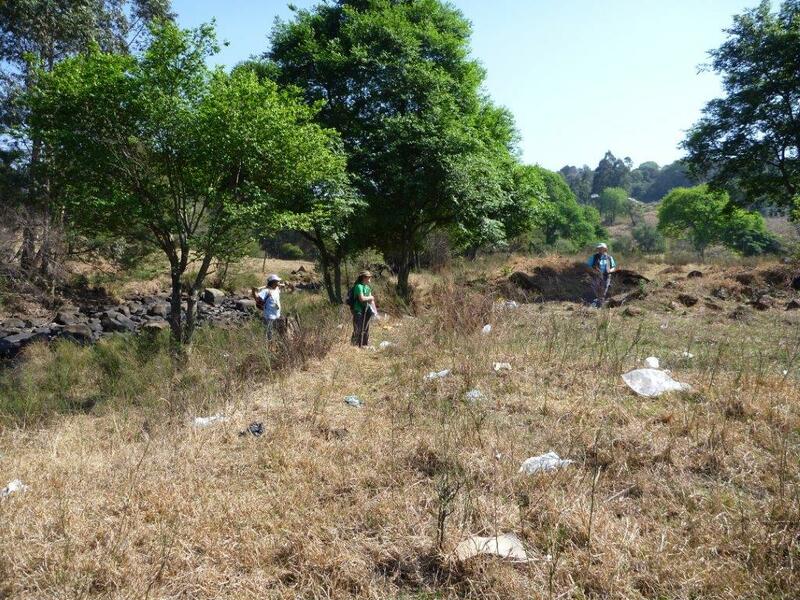 This entry was posted in Conservancy Action, Environmental Issue and tagged climate change, environmental acivists, Howick on September 22, 2014 by Midlands Conservancies Forum. 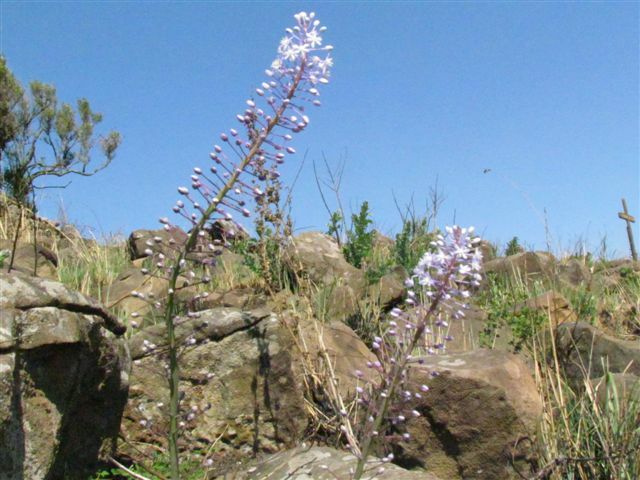 A sight not to be missed during September is the hillsides of Umgeni Valley Nature Reserve when the Dombeyas are in flower. 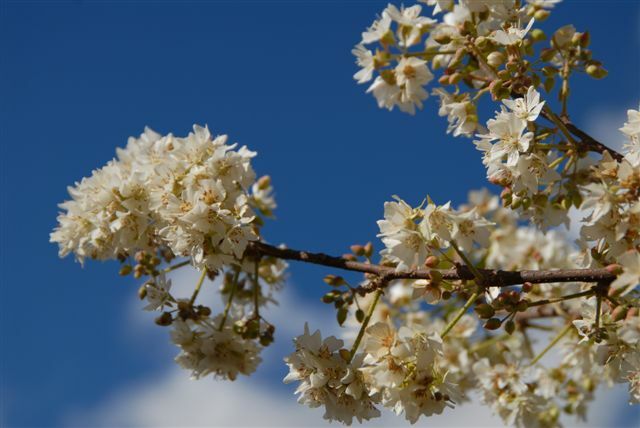 This small tree with dark brown, craggy bark and a rounded crown is literally covered in white blossom, which is particularly striking as the tree is usually leafless at this time of year. 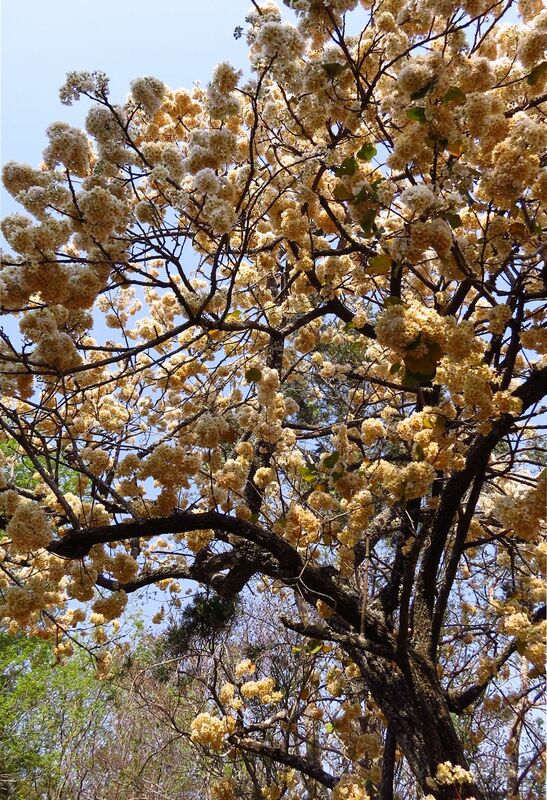 Each flower is about 2cm across and part of a heavy cluster at the ends of branches. 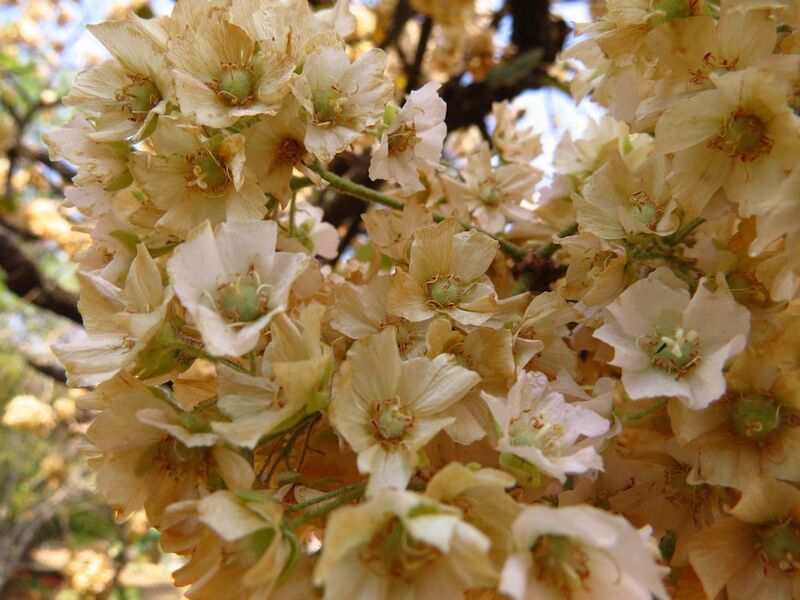 A quick growing and versatile tree, it does best in drier areas and is remarkably hardy to drought, frost and fire. The dark green leaves are heart shaped, and although rough, are popular with game, while porcupines are fond of the bark. Bees love the sweetly scented flowers which contain abundant nectar and pollen and it is also host to the Ragged Skipper butterfly. The wood is heavy and fine textured which makes it ideal for tool handles and bows and the bark is reportedly used for twine. Traditional medicinal remedies include treatment of heart weakness, intestinal ulcerations and palpitations in pregnant women. 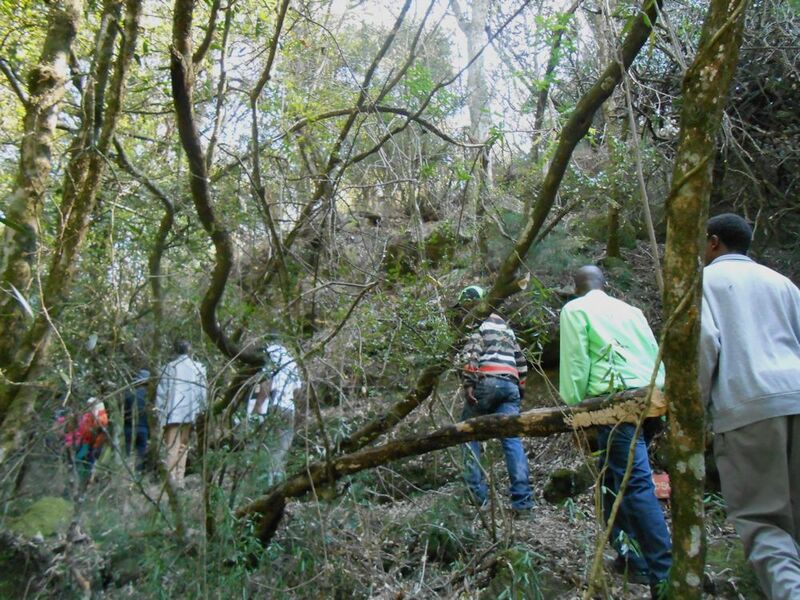 This entry was posted in KZN Midlands Wildlife on September 17, 2014 by Midlands Conservancies Forum. 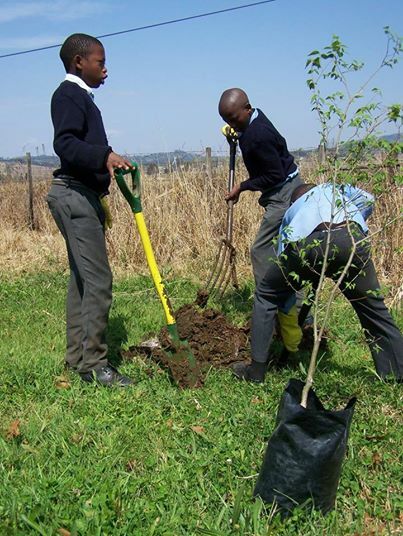 Each midlands Conservancy receives a slice of the Environmental Learning and Leadership pie for eco-activities in a school of their choice. 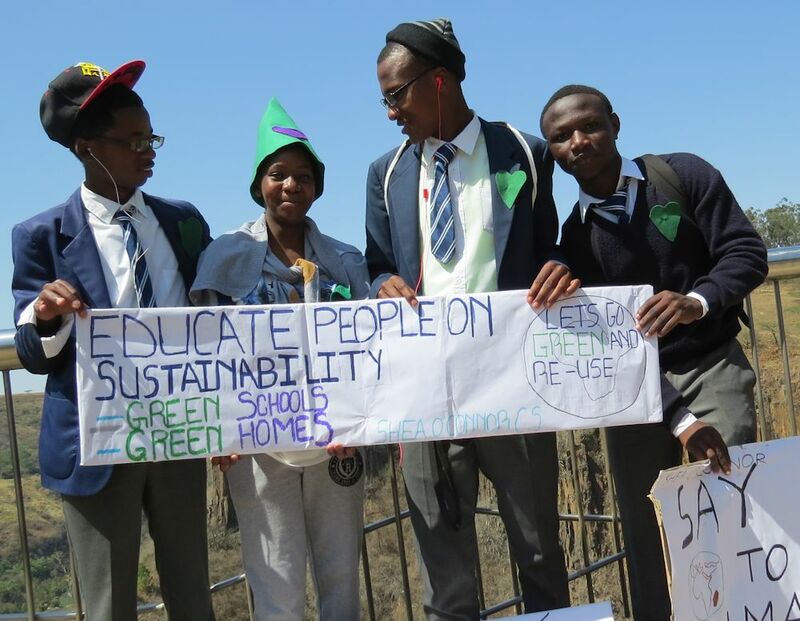 The idea being to build relationships between conservancies and schools in their areas, and to inspire youngsters to value the biodiversity and ecosystems on which we all rely. As there is little point trying to outdo the professionals at their game, we work with partners MMAEP and KZNCF to do what they do best. 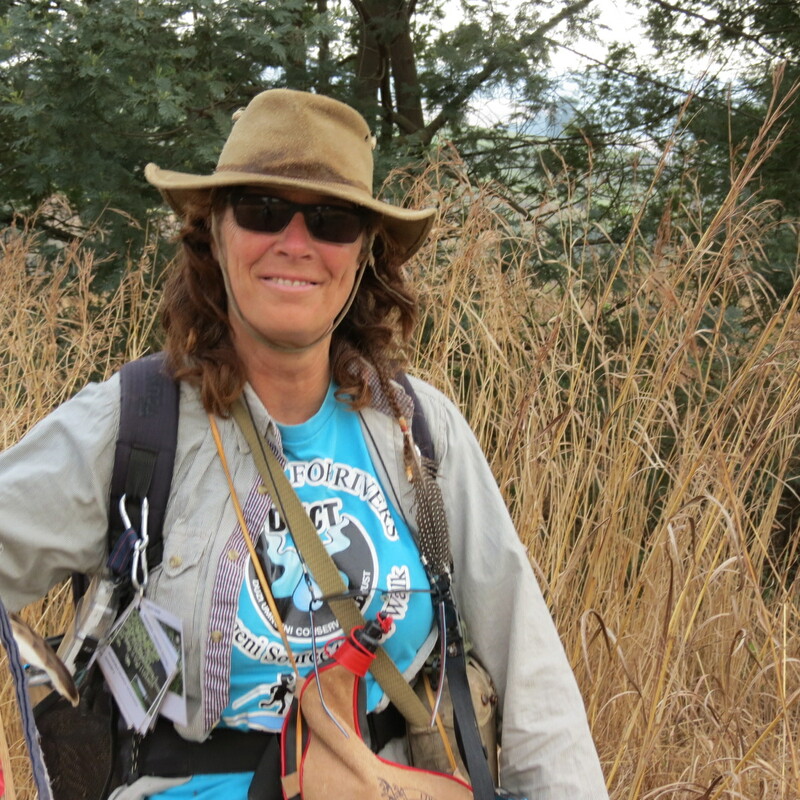 For some, it is easy to decide which school to work with – like Curry’s Post Conservancy. 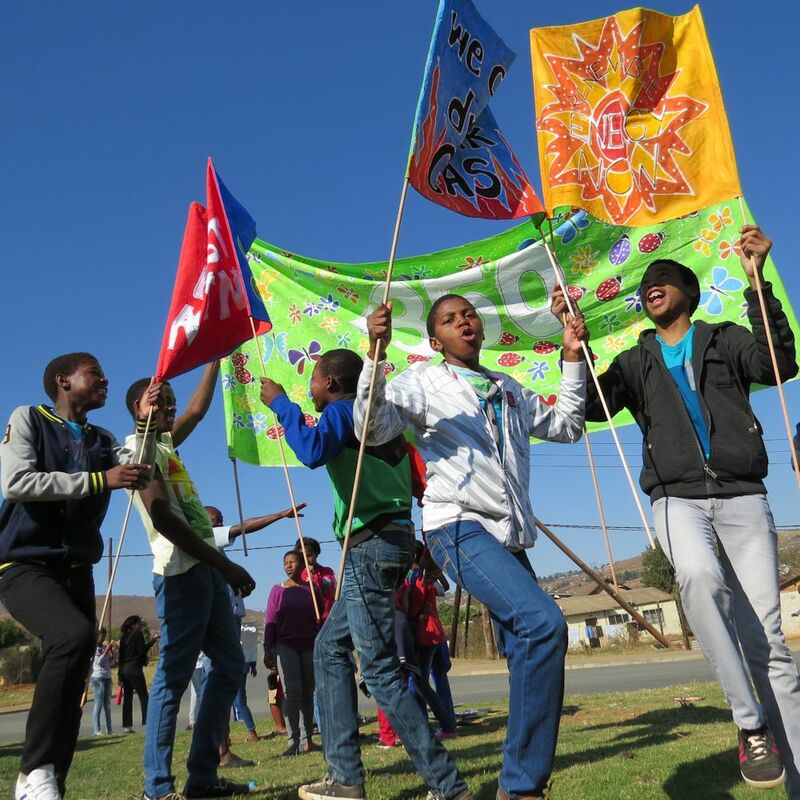 They already support Curry’s Post Primary and are thoroughly enjoying working with the MMAEP to assist the school achieve WESSA Eco-School status. MMAEP have turned the flower beds into veggie gardens and plan to sort out the library next. Recently, the MMAEP Bugs did lessons on Biodiversity. The little Grade 1 class was introduced to ‘nunu’s’ and learnt that an insect has 6 legs and three body parts and then set off outside on an insect hunt. 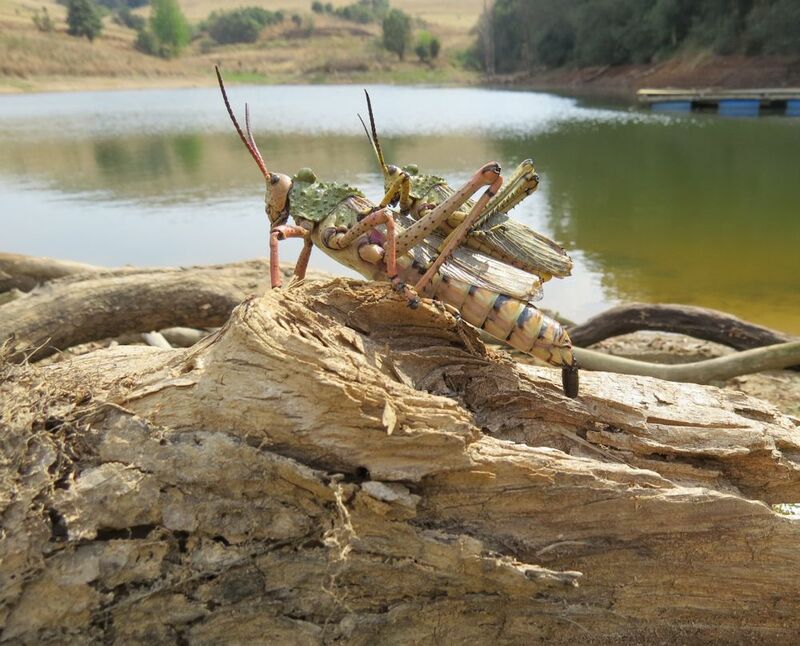 We managed to find some bugs – a locust (perfect), some flies and ants. Back in the classroom the children were given big pictures of different insects, chose their favourites and drew them with pastels and crayons. This exercise required focused observation and resulted in fantastic pictures. Grades 2 and 3 played the string card game where everyone is given a card depicting a different animal. 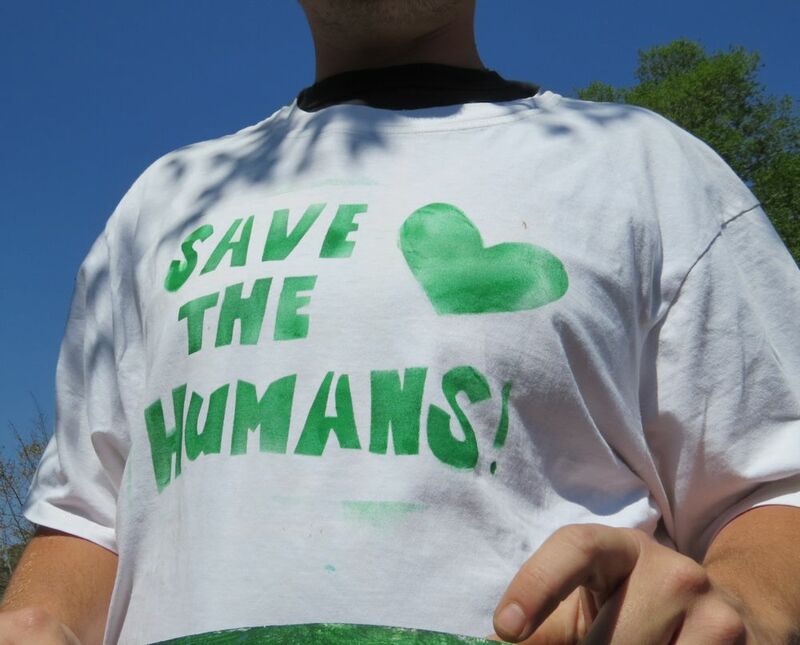 The game is about who needs who, not who eats who – the basics of ecology. We played the funky-chicken song and dance game, which is always a great hit, before reading a story. The other older grades learnt the word BIODIVERSITY and played the web of life game. We then selected local animals and birds for them to talk about and draw, ie jackals, cranes and buck. We also talked about habitat and characteristics and played the animal card game which shows the learners all the different species and categories of animals and where they live. 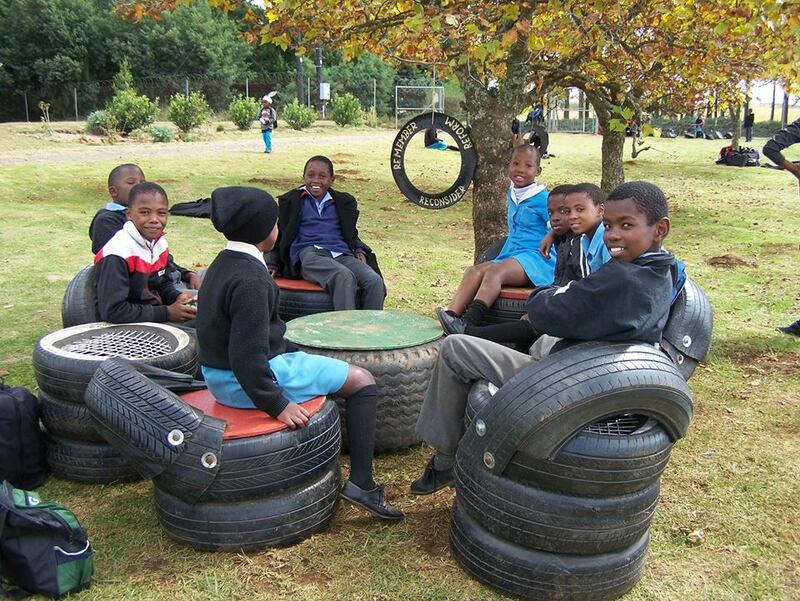 Mountain Home Primary School in the hills of Sweetwaters was chosen by Winterskloof Conservancy for a day of eco-art. The children were very excited to see the colourful MMAEP visitors arriving. The teachers were busy finishing their reports and were quite happy to hand over ALL the children – we had the Grade 2, 3, and 4 all together. 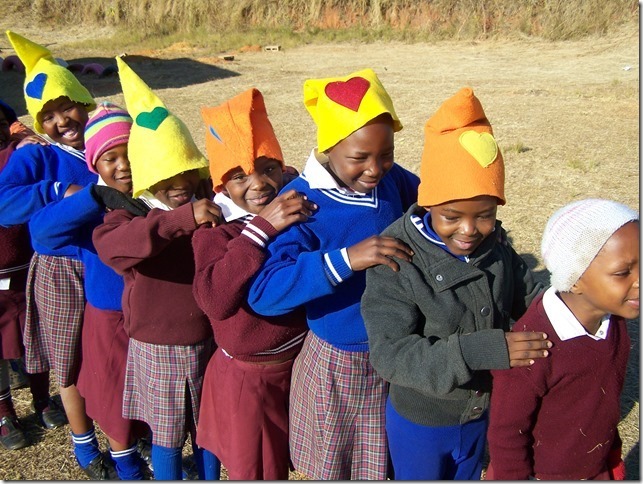 The famous magic hats were distributed. In a large circle we did some fun warm ups and ice breakers including two long massage lines which caused lots of laughter. 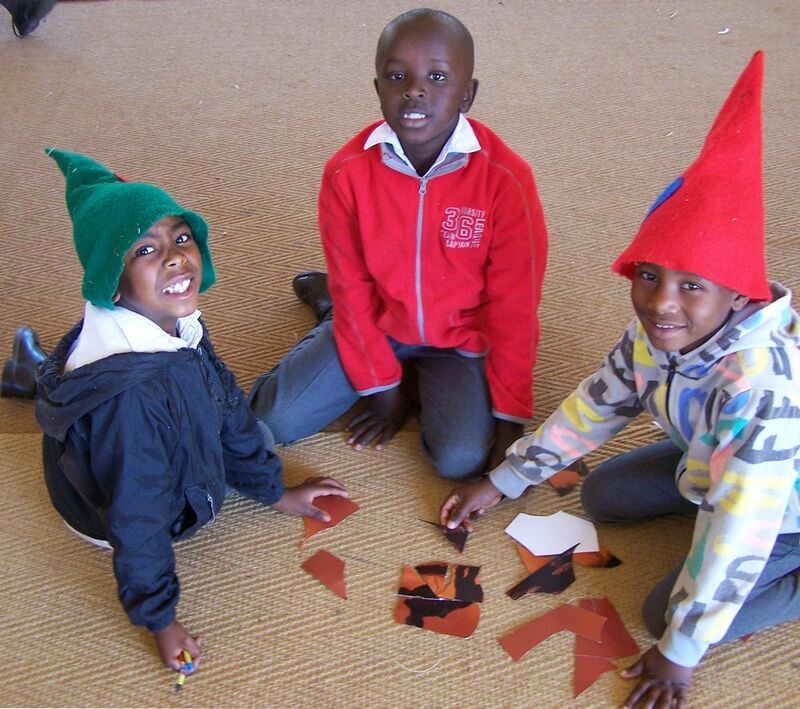 We set the Grade 2 and 3 class doing simple puzzles (made from cut up pictorial calendars). They found this VERY difficult. The older grade cut out colour groups from magazines to use in their eco-portfolio. We had some quiet time and read the story of ‘Siyolo and his jersey’ about a little boy whose jersey begins to unravel and he uses bits of it to help other people. It is a lovely story about kindness and sharing. 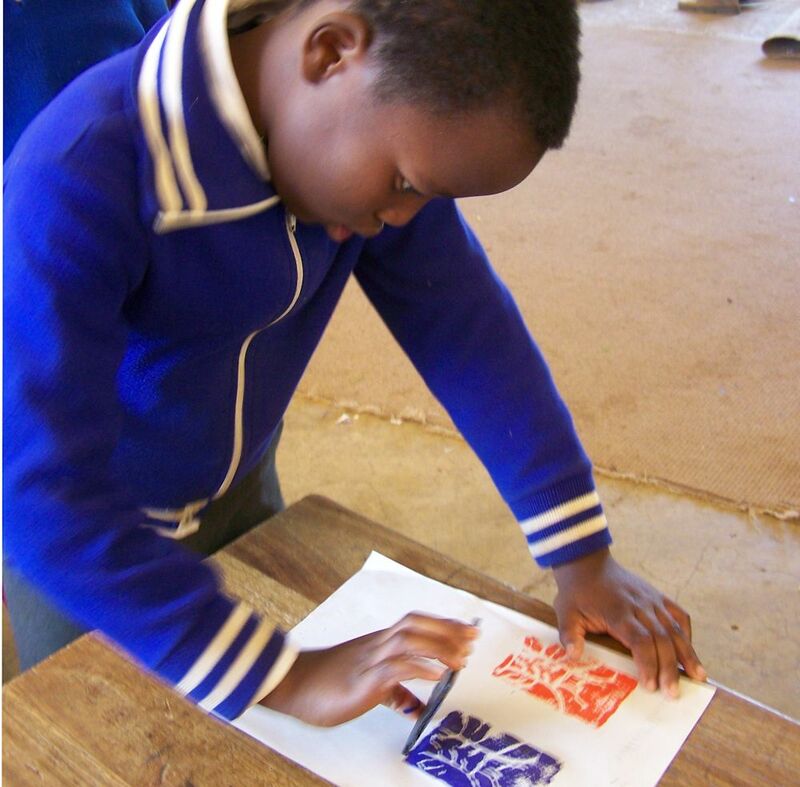 Afterwards the older children learned how to do printing using polystyrene trays and pencils. They carved out a picture about the story we had read and then lined up to get a selection of acrylic paint roller on to it and learnt how to print it on paper. They came up with some fantastic designs and were thrilled with their resulting pictures. They got more polystyrene and everyone got to do a few different prints in different colours. As they finished they went on to use their coloured shades of magazine cut-outs to create sections for their eco-portfolio. The teachers joined us at the end and were very interested in the printing as it combined recycling with some easy techniques. 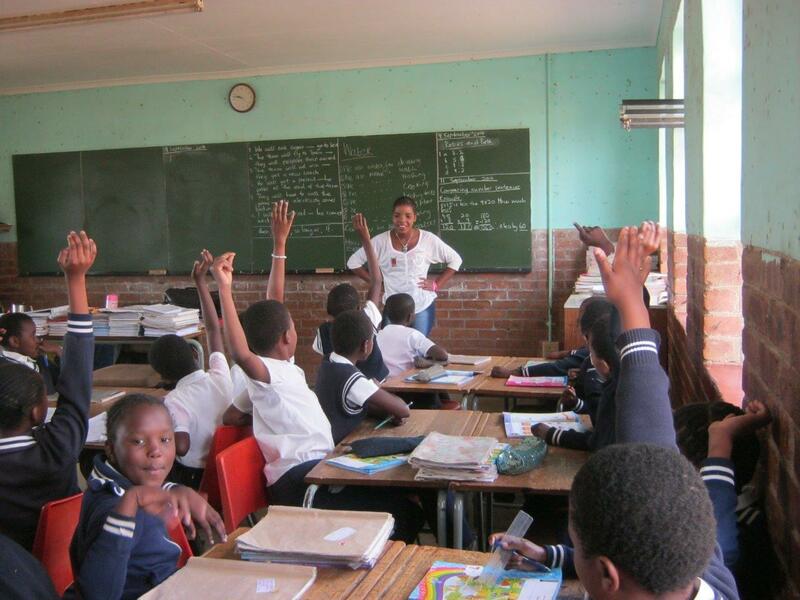 For many years Kamberg Conservancy has supported Dabulamanzi Combined School. 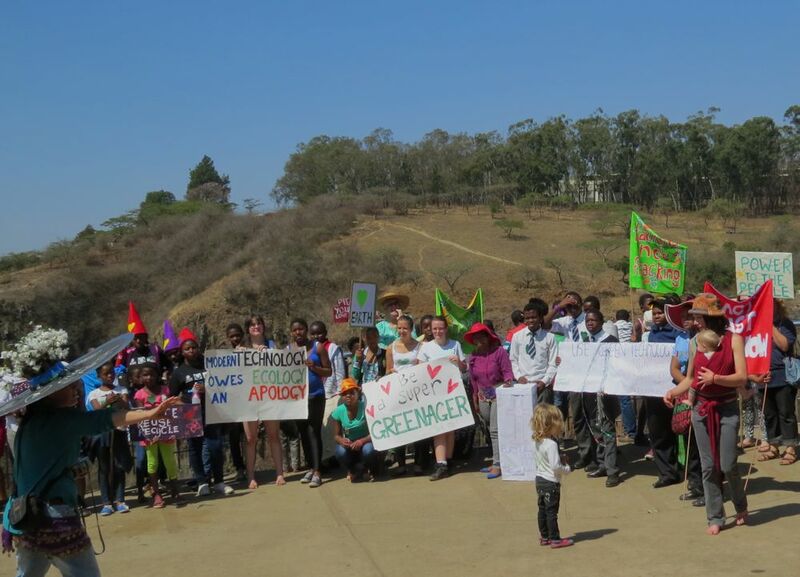 This year, in collaboration with the KZN Crane Foundation they sponsored an excursion for 26 Grade 4-7 learners to visit the Hlatikhulu Crane Sanctuary, to see and learn about the three African Cranes. After introductions, learners were taken down to the Sanctuary, where the rescued cranes are kept. 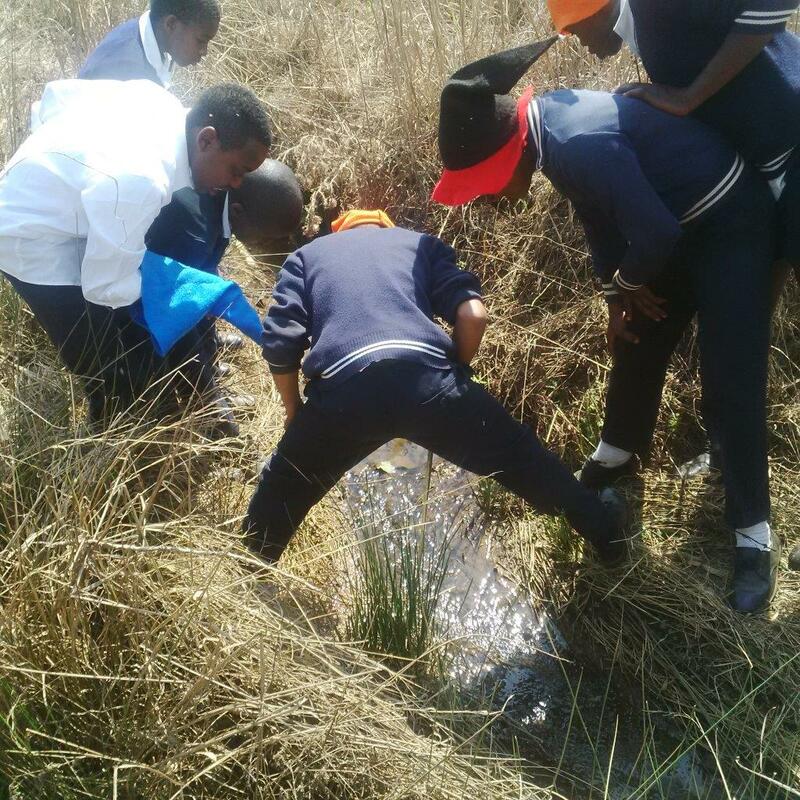 Learners said they heard about the cranes but most had never seen them, besides a few who had spotted Grey Crowned Cranes on farms in Kamberg. Learners couldn’t believe their eyes when they saw the cranes and couldn’t stop smiling. 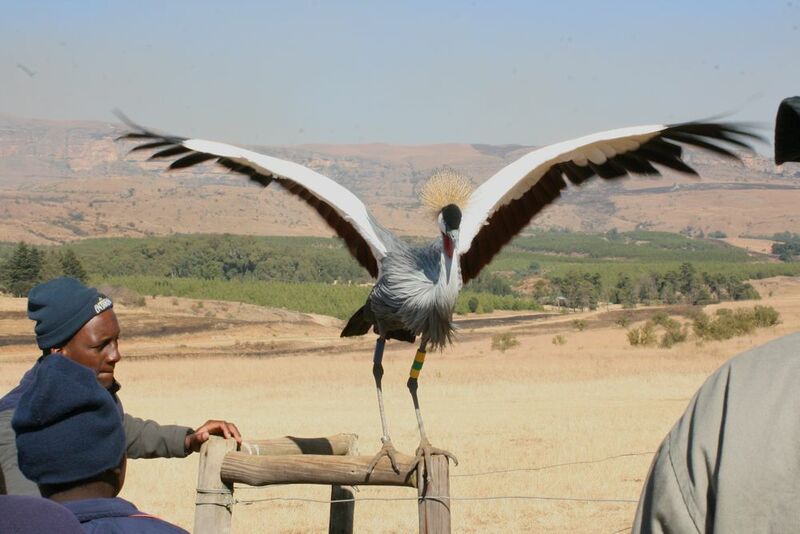 “The wattled crane is so big” said Siyanda Mncwabe, in awe. The hand reared Grey Crowned Crane called Boston accompanied them throughout the program, keeping the kids very amused. 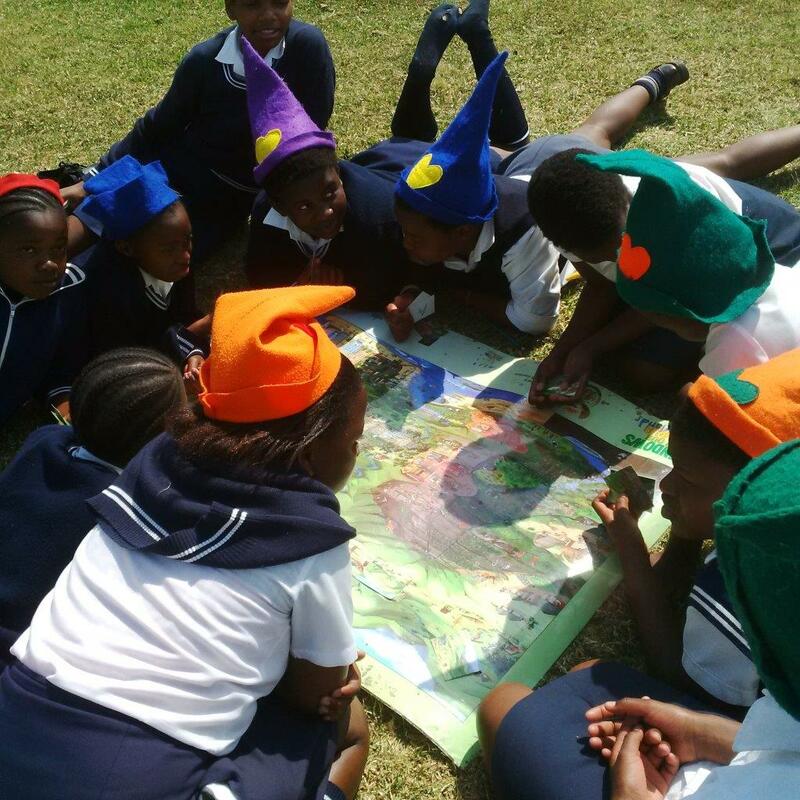 Learners then enjoyed two lessons from the Cranes in the Classroom series, facilitated by Nkanyiso Ndlela of KZNCF – Footprint Friends and Lily pad Lament. These painting lessons promote crane awareness and caring for the crane’s habitats, which are grasslands and wetlands. Learners and teachers participated well in these activities and the result was beautiful posters. The lessons took longer than expected because some were very slow and want to perfect their posters – they were very proud when they finished. 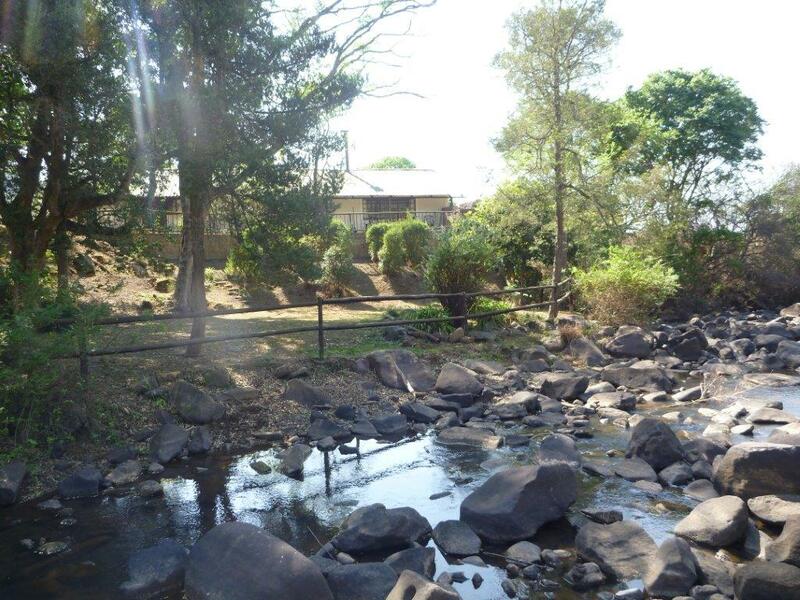 Cedara Primary School in Khanya Village at Cedara Agricultural Collecge is situated beside a wetland and stream. 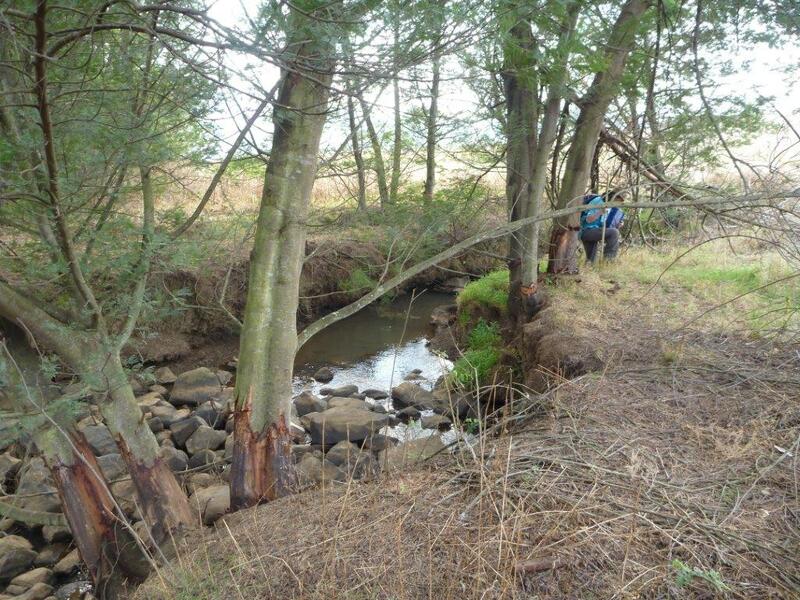 Doug Burden of uMgenyane Conservancy thought it a good idea to select this school as that stream flows into Gwensspruit which passes through their Conservancy and eventually into the uMngeni river. “Good for the kids to understand the impact their actions in the wetland has on the bigger catchment and down stream users.” he said. 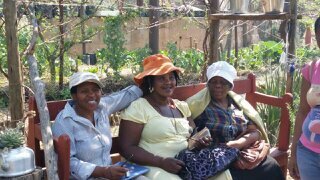 MMAEP facilitators, Zinhle Msimango and Gugu Zuma went to visit. 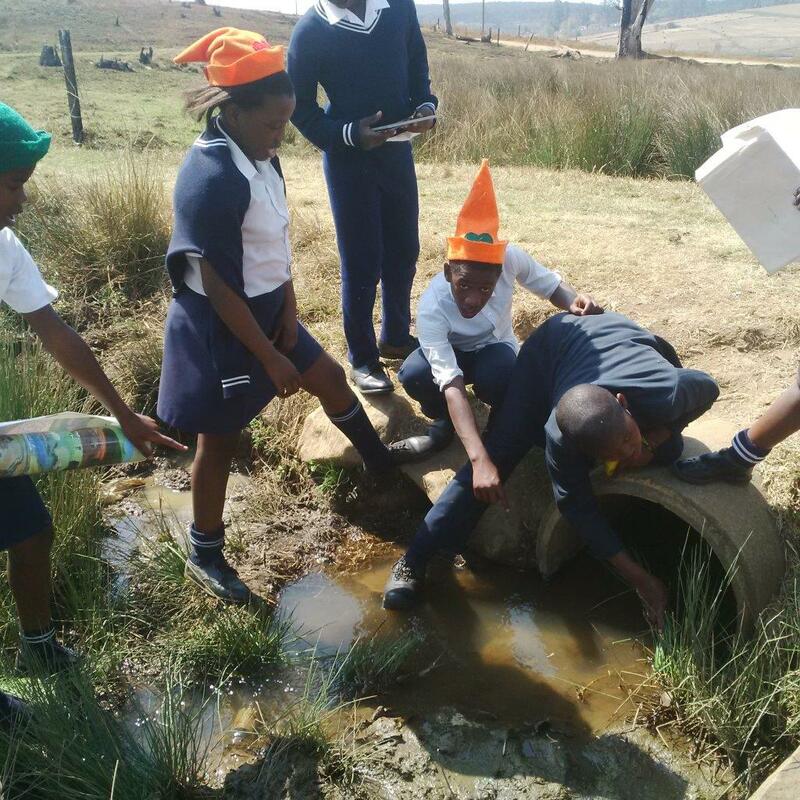 In the Grade 6 and 7 class Zinhle defined the word wetland – a wetland is saturated with water either permanently or seasonally and acts like sponge to store water. When we went to investigate the wetland we found that it was not as big as they thought. We spoke of the plants and animals that can survive on the wetland. We only had a chance to see a crab in the wetland this day, probably because the water is polluted and the wetland to had too much litter and in some areas it had a bad smell. We did a water cycle lesson for the children and used the Windows on our World Wetland Catchment game. Children used cards and a chart to put right pieces of cards in the right place. 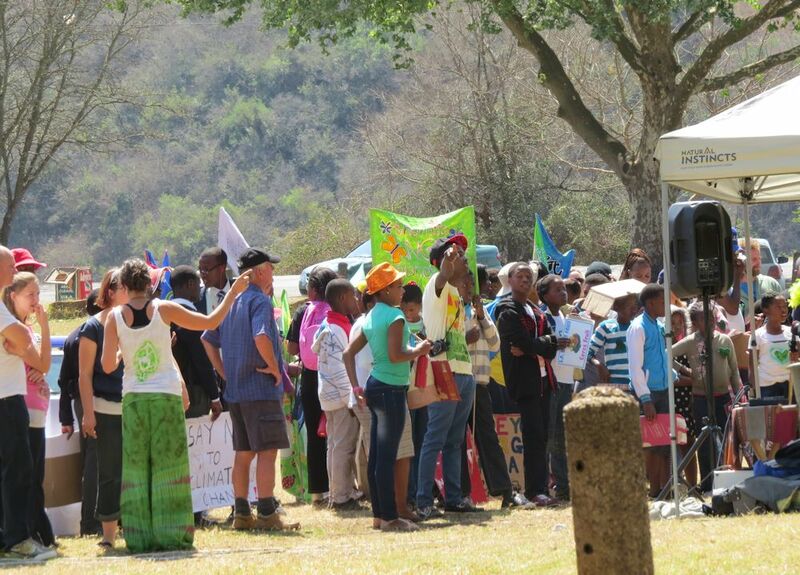 Water, wetlands and people. With the Grade 4 and 5 class Gugu discussed the importance of water and why we need to take a good care of our streams and rivers. 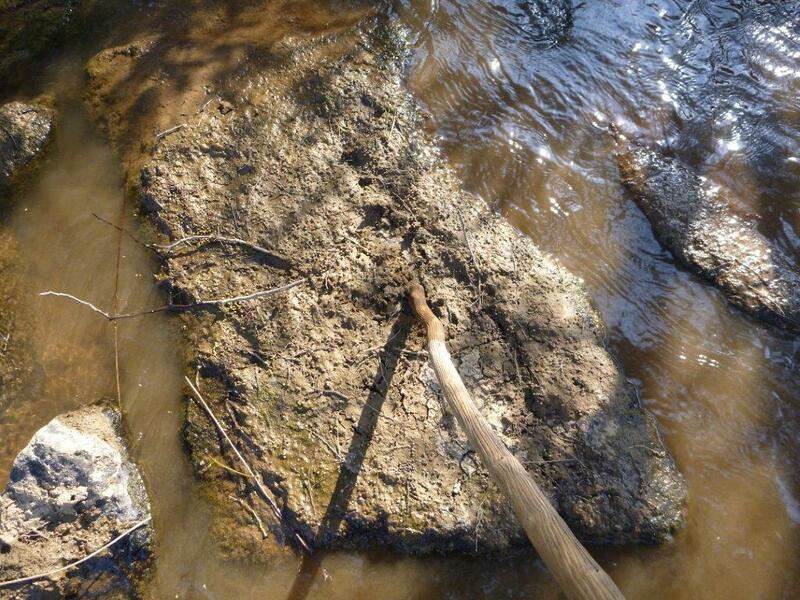 They filled in a worksheet with two rivers – one was clean and the another one was dirty. After break everyone went down to the stream to do a mini SASS. 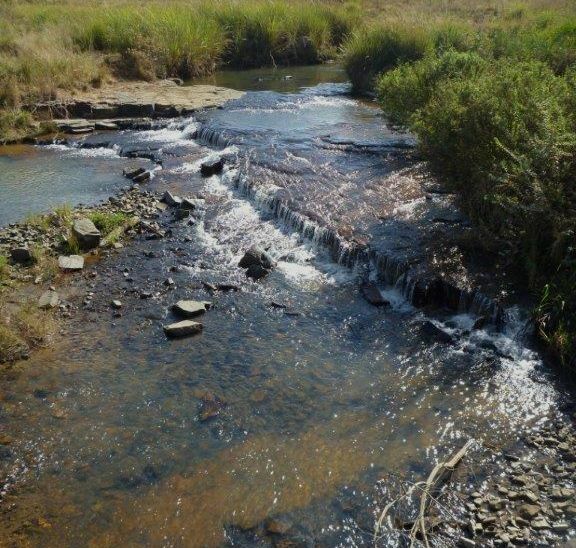 This stream does go into the uMngeni river after some time. 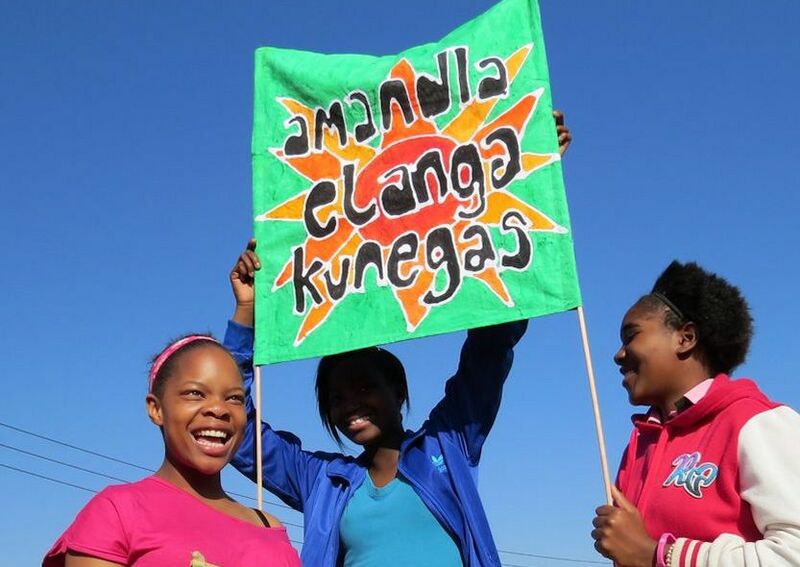 They were surprised that five million people use water from the uMngeni river. They learnt about the small insects, animals and plants that live in the river. Our miniSASS test showed that water wasn’t in a good condition. “It was a lovely day in the school we had so much fun and learned a lot. 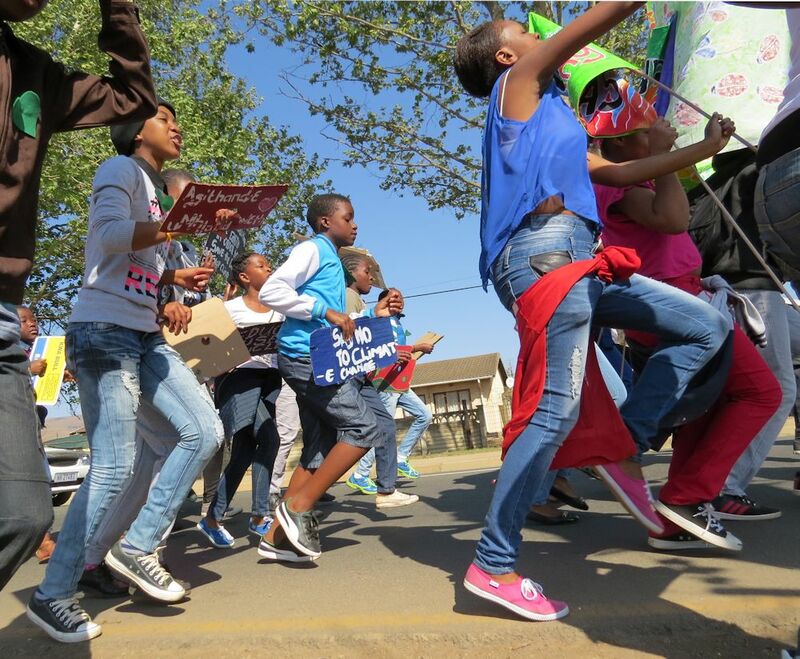 You guys are amazing” said learner Ayanda Hlophe. 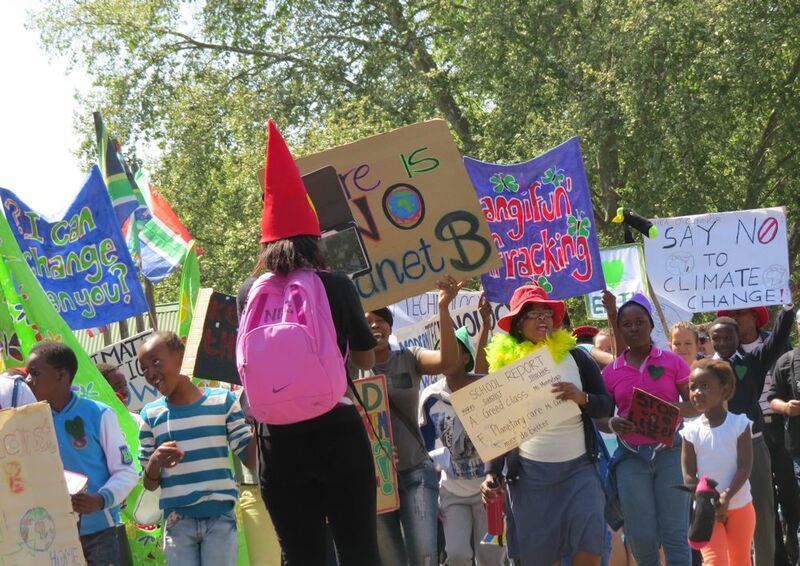 ZInhle comments: “It was interesting for me and the children as they said they know of wetlands but never had a chance to learn about it and to learn about it practically. 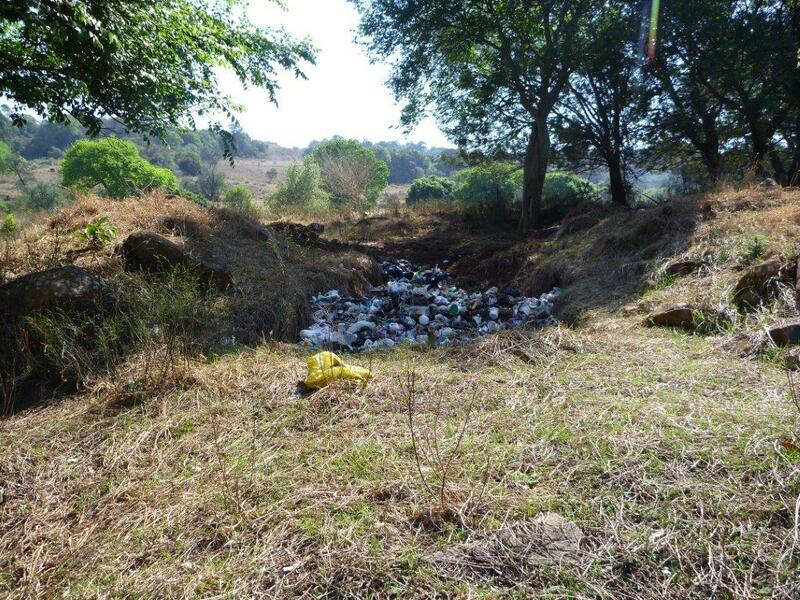 I feel people in the area need to be educated in not polluting the wetlands as it seems they just come and leave their rubbish in the wetland. I hope our lessons help. It was a fun, hot, productive day. 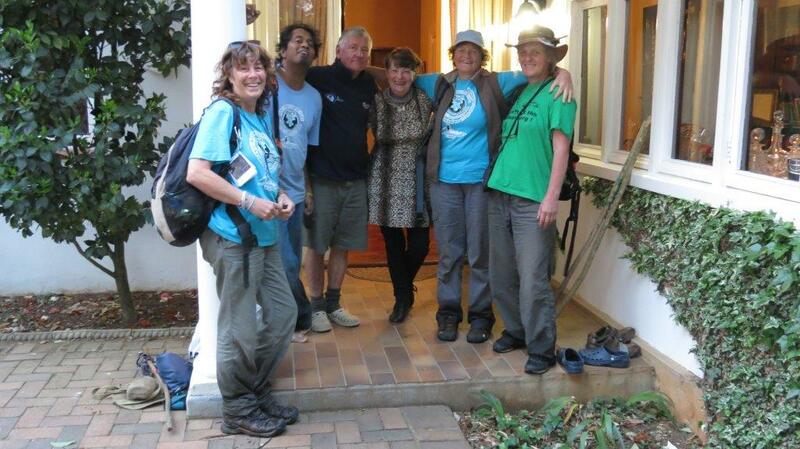 Thank you to the Midlands Conservancies Forum and uMgenyane Conservancy for supporting meaningful environmental education in the midlands.” Educator Petronella Gasa concludes “We were very glad to meet the new Bugs team. 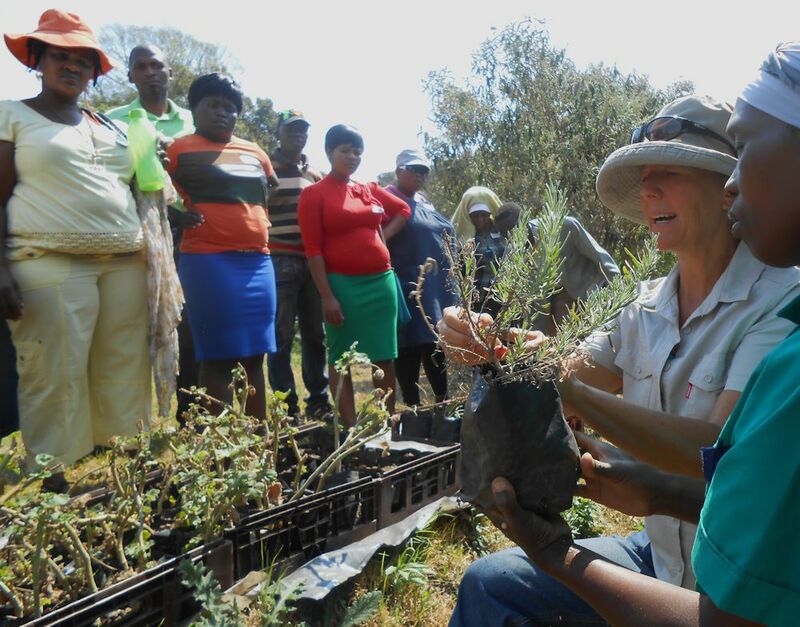 We hope that we can have more environmental lessons with them.” Derren Coetzer, Chair of the uMgenyane Conservancy, is looking into arranging an excursion for the older learners to the Hilton College Nature Reserve later in the year. World’s View Conservancy battled a bit to find a school to work with, but then hit the jackpot! At Sibongumbovu Primary in Cedara, dynamic Vanessa McKay has recently started working as the English teacher and inspiring Beth Drennan runs the library, ensuring that the learners have regular access to books and a real appreciation of their value to learning. Eidin Griffin of the MMAEP worked with the Grade 6 and 7 class introducing them to the word Biodiversity (and was thrilled when they came up with the words Biosphere and Bio-fuels). 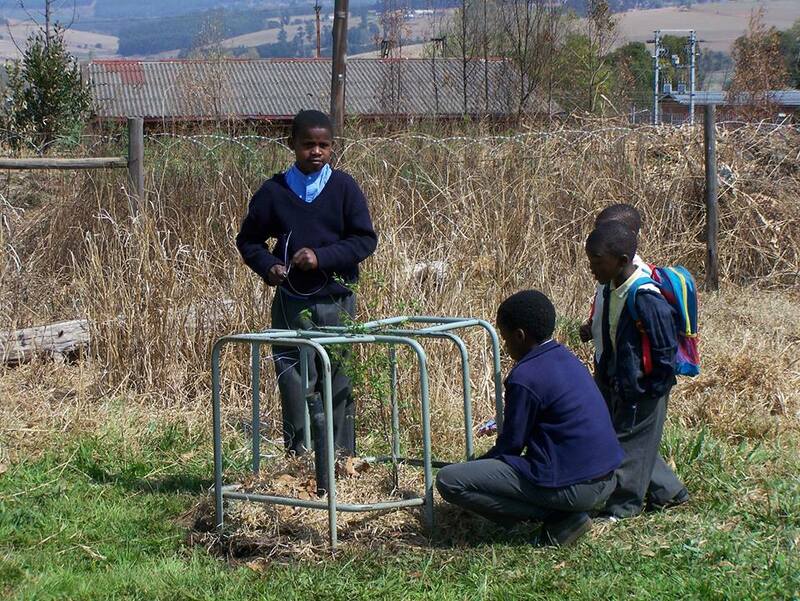 They looked at the concept of trees as habitats and practiced some ‘genius’ techniques like quiet time and breathing exercises. After reading ‘The Lorax’ by Dr. Seuss, everyone skipped outside to plant a Celtis africana (White Stinkwood) near the tap run-off. The younger children danced and sang and blew loving kisses to the tree to help it grow! Elli Hamilton of World’s View Conservancy comments: “I visited the Grade 7 class the day after Eidin’s visit and Vanessa was in the process of recapping their exciting lesson from the day before. 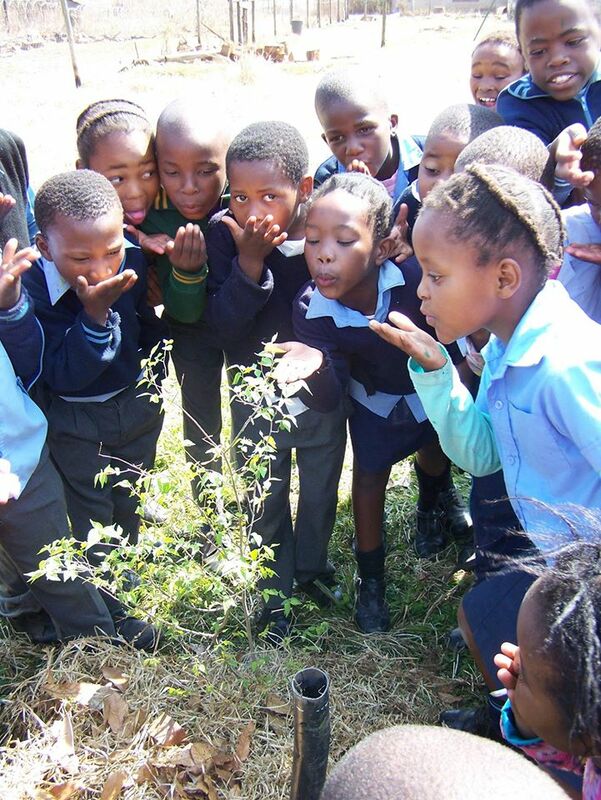 The children were involved and enthusiastic and Vanessa used her laptop to show us all pictures of the lesson and the tree-planting session. During the lesson I was also able to appreciate the colourful , cheerful artworks and displays in the classroom with some even hanging like celebratory bunting from the ceiling. One of the girls took me out to introduce me to the newly planted Celtis Africana and on the way through the grounds I noticed that there is another well established ( 12 year-old? ) Celtis near the school buildings. 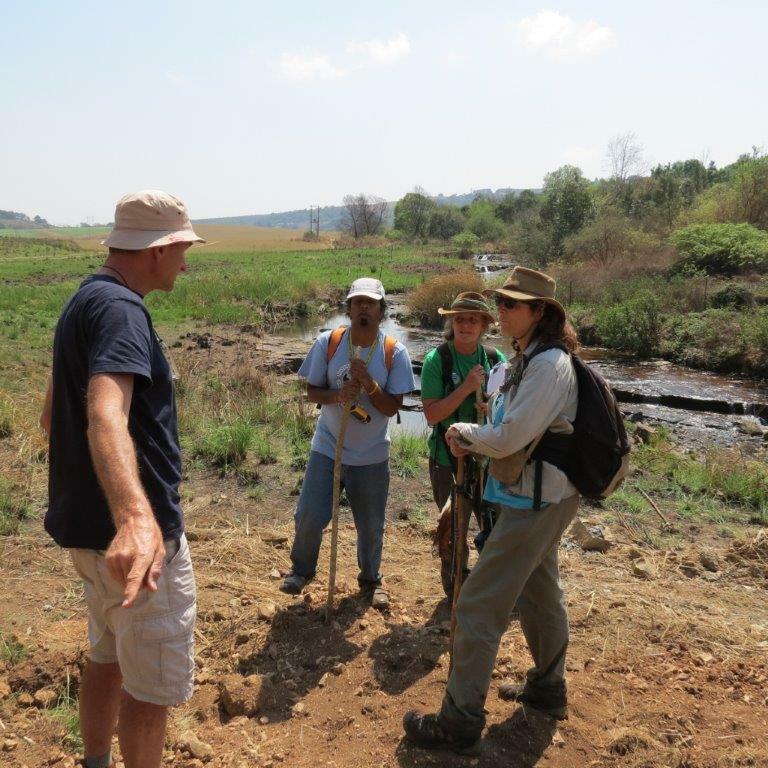 Learn more about good work of the Midlands Meander Education Project and the KZN Crane Foundation . 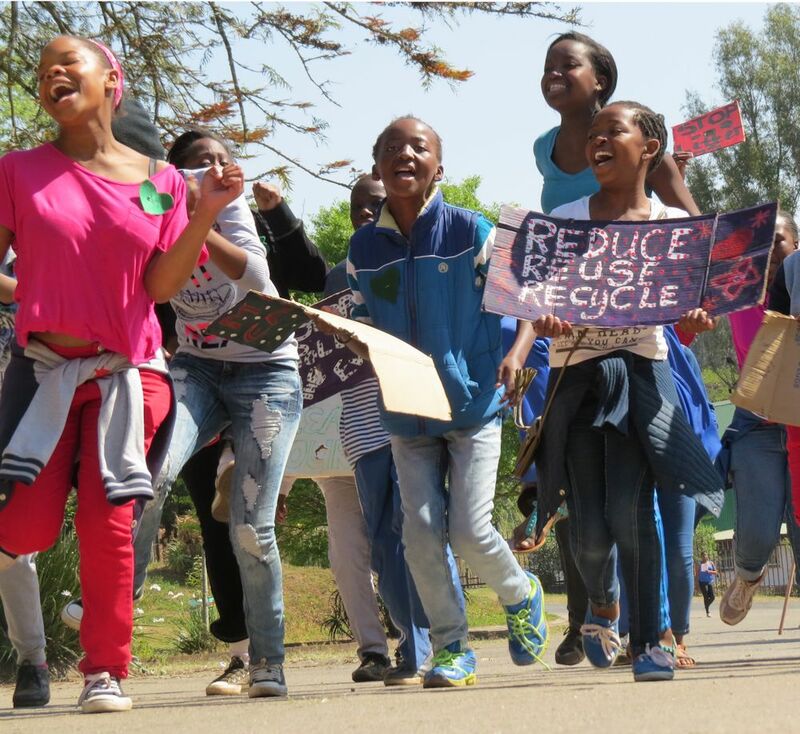 MCF are proud to count them as partners in our Environmental Learning and Leadership Programme which is funded by N3 Toll Concession. 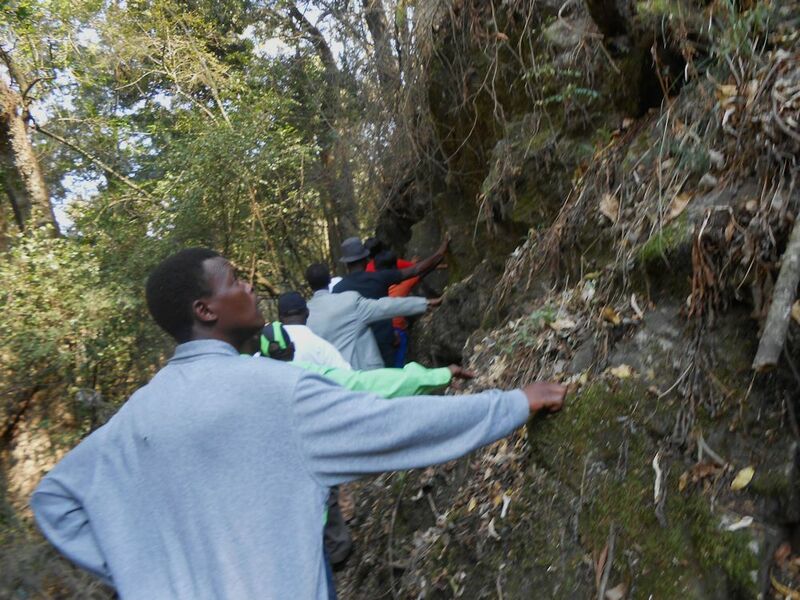 This entry was posted in Conservancy Action, Environmental Learning and tagged environmental education on September 15, 2014 by Midlands Conservancies Forum.